“Sweet or unsweet?” One of the first things you notice upon moving to East Texas is that restaurants here serve not one, but two types of tea – sweet or unsweet. While the rest of the country has to make do with attempting to stir sugar into cold tea (where it will NOT dissolve, but rather settle into the bottom of your glass as a super sweet sludgy treat at the end of your glass), the South contains a vernacular region which might be labeled as the “Sweet Tea South”. Sugar is added to the boiling water before the tea even begins to steep, and the resulting beverage is a tooth-achingly sweet nectar favored throughout the region. For years before I moved to this mecca of sweet beverages, I had to rely upon artificial sweeteners or suffer through unsweetened tea. But now, I was free to enjoy actual sweet tea. Bliss. Of course, I could make sweet tea at home, but mine was never as sweet. Convinced of the dangers of high fructose corn syrup and artificial sweeteners, I was lulled into a sense of security drinking “natural” sugar. I was so completely convinced that “real” sugar was so much better for us (in moderation, of course) that I convinced my son to give up soft drinks in favor of sweet tea. It took only 3 years for me to realize my mistake. Actually, it was my doctor that informed me that my health was declining rapidly. While I have been overweight most of my adult life, my “numbers” had always looked great. Normal to low blood pressure, cholesterol levels perfect, blood sugar perfect – model of health numbers. Three years of living in the “Sweet Tea South” had driven all of my numbers out of whack, and my sixteen year old son had high blood pressure. Obviously, other factors come into play. 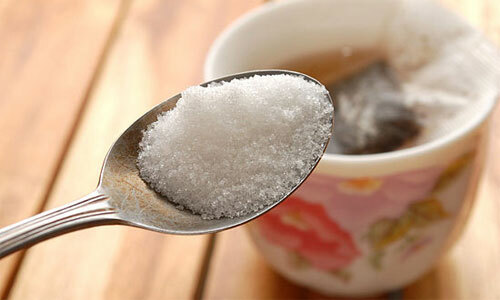 Surely, sugar cannot be the only culprit. But, six months later, my blood work after a total boycott of sweet tea (and nothing else – no other dietary changes, no increase in exercise…it’s a process) showed everything returning to normal levels. True, this is anecdotal evidence, but as I learn more about the food industry and the regulations which govern it, I am beginning to realize how little average consumers actually know – and how little we can believe of what we are told about the food we eat. I have spent my entire adult life buying groceries – more decades than I really care to reveal, and I have seen many changes in the typical American grocery store. One of the more alarming changes was the increasing numbers of Hummers being driven by suburban moms. Surely, there are few places safer than a suburban grocery store – there is certainly no need for an urban assault vehicle. But, as I journeyed through my favorite store recently to conduct an analysis of its candy displays, I began to realize that our grocery stores are, indeed a battle ground. Immediately upon entering, we are assaulted by companies attempting to earn our shopping dollars through any means necessary. Product placement, packaging, coupons, banners, “give-aways”, convenience, and other forms of marketing all lead us to the products “they” want us to buy. “They” being the long line of corporations who stand to earn money off our purchases – the grocery chain, the marketing companies, the food conglomerates, and the industrial farmers. Each of these groups has spent millions of dollars convincing us that their “food” is what we should eat. In order to keep prices down, and keep us buying their products, they have engineered the food to hit the “bliss point” – the ideal ration of fat, sugar, and salt which makes their product irresistible. As a result, our stores are now full of food which, at best, is unhealthy for us – at worst it is quite literally killing us. Maybe the urban assault vehicles are not such a bad idea, after all. Dollar General is not typically considered a “grocery store”. This chain of over 11,000 stores nationwide bills itself as a “small box discount retailer” (Dollar General) and according to the website, it is the largest chain of its type in the country. Dollar General functions as the modern equivalent of an old general store. 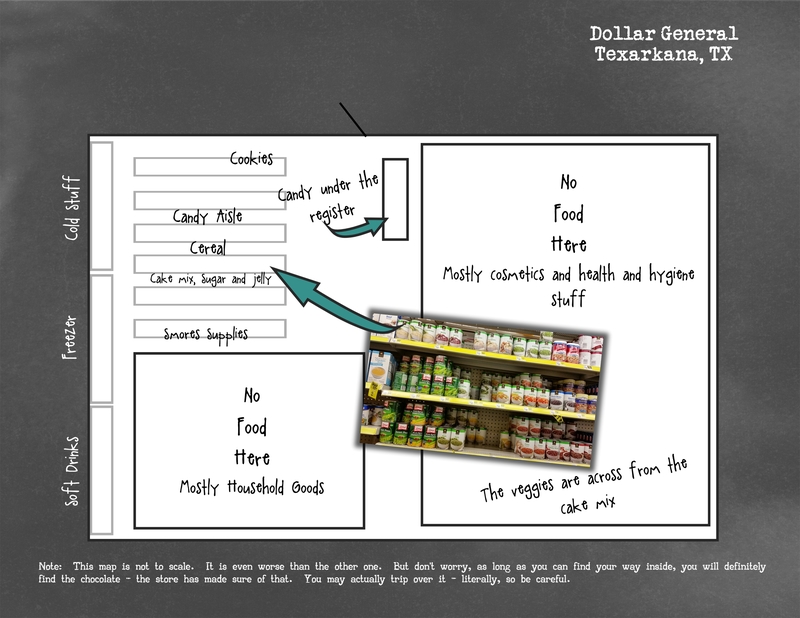 Their goal is to “…make shopping for everyday needs simpler and hassle-free by offering a carefully edited assortment of the most popular brands at low everyday prices in small, convenient locations.” (Dollar General) With 14 locations in Texarkana (see map), Dollar General is most often the closest place to buy grocery items. In fact, in some parts of town, Dollar General (and its counterpart Family Dollar) is the only place accessible for nearby residents. As indicated on the population density map, the neighborhoods surrounding this particular Dollar General have the lowest population density within the city, which partially explains the lack of larger chain grocery stores. But, as indicated on the median income map (you may need to click on the different layers in the map to switch between them), this area also has the lowest average incomes within the city. Discount stores like this are particularly important in low income areas where residents have limited income to spend on food. As is illustrated in the image, this store displays numerous signs indicating that both of the most common food assistance programs’ cards are accepted at this store. In addition, there is only one bus line which services this area. While it is possible to reach one of the larger grocery stores via public transportation, this would require riding one line all the way downtown and changing to another bus. According to Google Maps, it would take a driver 6 minutes to reach the nearest Albertsons 3 miles away, but a commuter taking the bus would not arrive for another 54 minutes. It is not uncommon to see people walking from the surrounding neighborhoods in order to do their shopping at this particular Dollar General and other nearby locations. Additionally, there are many small towns nearby which do not have a larger grocery store, at all. As a result, for people without access to regular transportation or who live in surrounding rural areas, Dollar General often serves as their primary grocery store. Given its role as de facto grocery store, it is important to include stores like Dollar General in this analysis since the products it offers will most likely constitute the primary groceries purchased by nearby residents who are unable to reach the larger markets. Upon entering the store, the shopper is immediately confronted with an assortment of “junk foods” – foods that are “very high in calories relative to nutrients”. (Albritton 344) On the left, clustered around the cash register are cases of candy and soft drinks. The perfect location for impulse buys just before or during check out. The candy, which consists of 3 rows over 4 feet long, can be found just under the register – the perfect height for any children accompanying the adult shopper. In fact, the entire bottom row is full of candy packaged with toys – making them doubly enticing so children will pester their adult companion for a purchase. The candy at this particular location is also packaged in “single serving” sizes – designed to serve as self-gratification or as a snack or meal substitute. Directly across from the cash register are the grocery aisles. Given the emphasis Dollar General places upon providing “everyday” products, it can only be assumed that regular shoppers require large amounts of chips, cookies and candy, since those are the objects which fill the first three aisles. The candy here, which has an aisle to itself, consists of bulk packages of “sharing” candy – either large numbers of individually wrapped “fun size” servings, or “king size” packages of unwrapped hard or hard shelled candies. The term “fun size” is intended to create an image of the fun the consumer will have eating and sharing these tiny portions – great sizes for very young kids, too. The “king size” portions offer up images of wealth and excess – having extra goods to show your generosity or indulge your larger appetites. The other major candy location (although there are many others) can be found along the seasonal aisle, where the standard summer s’mores display provides a convenient location for all of your s’mores needs, including a wide array of marshmallows (different flavors and sizes) and your standard Pennsylvania-produced chocolate bars. Finally, candy of all types can be found hanging along the end caps of several of the grocery and non-grocery aisles, alike. Clearly, candy and chocolate are considered “everyday” objects that should be made as conveniently accessible as possible throughout the shopping experience. Beyond the candy, cookies, and chips, however, there are “regular” food items like cereal, milk, beans, rice and even canned vegetables. A careful perusal of these items reveals some alarming trends, however. First, the milk section contains as much chocolate milk as it does regular milk, and the presence of chocolate in milk is almost always accompanied by an increase in sugar. While milk contains its own natural sugars, most chocolate milk contains added sugar – either in the form of natural sugar or high fructose corn syrup. One particular brand of chocolate milk billed itself “Protein Plus”. The product does have 25 grams of protein, which it states is 12% more than regular milk; the product also contains 37g of sugar – more than three times that found in regular milk. Apparently, the “plus” means “plus sugar”. Of the cereals available for purchase, none had any appreciable fiber (over 2 grams per serving by this particular mother’s standard – and that is LOW) and all had fairly high levels of sugar and calories, making them marginally junk food by Albritton’s standard – though the artificially enhanced nutrients pacify most people’s sensibilities when it comes to breakfast cereal. More troubling, however, was the presence of chocolate and sugar in other foods – even foods that are generally considered healthy. Cereal bars packaged as snacks and meal replacements have as much sugar as the candy bars one aisle over. Of the cereal bars at this particular location, over 15 (about half) had some form of chocolate. 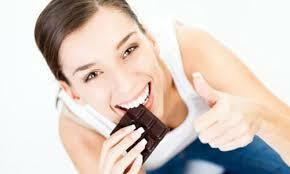 The ones with chocolate tend to have even higher amounts of sugar than the others. Nuts and dried fruits, once the hallmark foods of healthy eaters, are now covered in chocolate or yogurt (another “health food”) which really means they are now covered in sugar. The presence of chocolate in these snack foods is intended to show that chocolate is a good “…source of concentrated energy…” (Robertson 19) The final, and perhaps most troubling issue, however, is the amount of real estate that is allotted to sugar and sugar-added foods versus non-sugared foods. The amount of shelf space allotted to a product indicates a great deal about what products the store wants to promote and how much money companies have paid to have their products placed in ideal locations. All total, the sugared products in the store occupy well over half of the total shelf space dedicated to shelf stable foods. In the freezer section, about half of the space is given to frozen desserts. And half of the refrigerated section is juice and chocolate milk. Clearly, sugar is considered a major “everyday” need. Unfortunately, beans, rice, and vegetables are not considered as important, and are therefore not given as much space. It is possible to find vegetables – canned and full of salt, but at least no sugar, across from the cake mix, but only part of three shelves is given to vegetables and the selection is extremely limited. There are a few bags of frozen mixed vegetables in the freezer area, but otherwise, there are no other products containing vegetables in the store. Beans and rice are the other major non-sugar food items, and they are given quite a bit of space, but other forms of protein or complex carbohydrates are difficult to find. Finally, while the canned vegetables do get prime real estate at eye level in the center of the aisle, the packaging on all of the non-sugared foods is fairly plain and there are no “fun-size” or “king-size” cans of green beans. As already stated, as a discount general store, Dollar General has never marketed itself as a primary grocery store, but for many people it is their main option when purchasing food. If this is the case, then it is certain that their diets have little in the way of variety, unless it is in the myriad of ways in which sugar crosses their plates. Two days after my visit to Dollar General, I pulled into my primary grocery store – the Albertsons closest to my house. 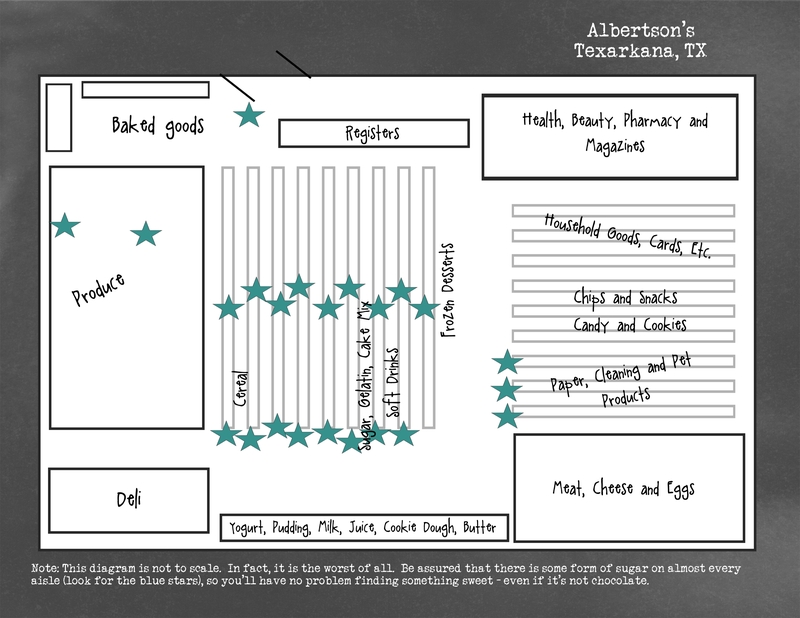 There are three Albertsons in Texarkana – two in Texas and one in Arkansas. According to the Albertsons website, there are over 600 stores in this Idaho-based chain. Albertsons claims to be a “modern grocery store” (Albertsons) with a long history of providing services “…customers (haven’t) seen in a grocery store before…” (Albertsons). One major innovation that the company introduced in its early days was the in-store from scratch bakery. Albertsons’ dedication to its in-store bakery concept is strongly reinforced by the premium location it occupies in this store – customers quite literally trip over the “grab and go” cake slices located mere steps inside the door and all customer traffic is directed immediately into the baked goods area. There is a case of pre-seasoned fresh meat to slap on the grill for dinner tonight, the cake slices for dessert, and a mere step away you can pick up peanut butter, jelly and bread for lunch tomorrow. You can even pick up a bouquet of flowers for the table, all without ever leaving sight of the express checkout lane. Oh wait, those aren’t flowers! 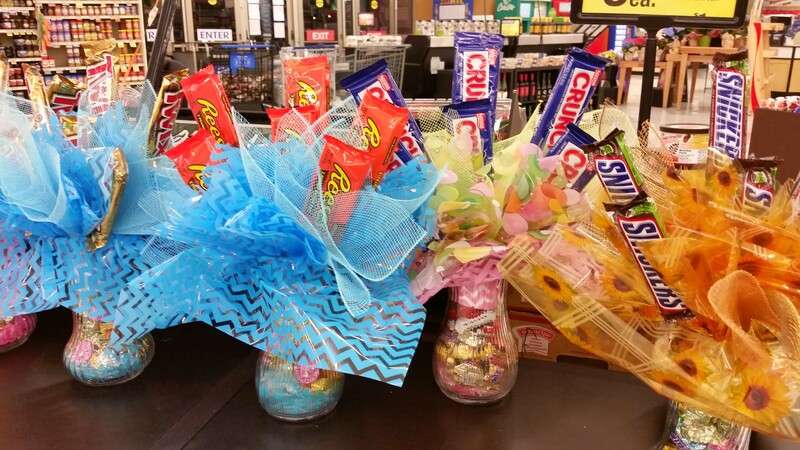 The bouquets artfully arranged in vases by the door are actually composed of candy bars! These seem to be a new item and since Mother’s Day was in less than a week, I could only assume that Albertsons felt your mom wanted a bouquet of candy bars – perhaps they’ll last longer than the cut flowers. Venturing into the store, I was certain that the state of affairs in a “real” grocery store was not nearly as bad as the state of things at the general store. But, despite my beliefs that I am a careful, observant and educated shopper, it quickly became clear to me that things here might even be worse. To be fair, fresh produce, milk, meat, and cheese do get quite a bit of optimum real estate in this grocery store. True, customers have to walk through the artfully displayed baked goods in order to reach the broccoli, but the broccoli is there. The selection is limited to standard produce items, but there are a lot of them and there is even a quite decent organic section. Best of all are the pre-cut “convenience” vegetable packs which, while much more expensive than their counterparts, make preparing fresh vegetables much easier and saving valuable food prep time – something busy working parents highly desire. Sadly, these very items are located merely inches from the cheesecake freezer and right alongside the smoothies. Smoothies are one of the major “health” food trends right now. They have replaced candy bars and snack bars as the predominant meal replacement. However, I immediately spotted another chocolate flavored “protein plus” shake. At first glance, this one looked a bit better than its Dollar General counterpart – 30 grams of protein (versus 25 grams) and only 26 grams of sugar (versus 37 grams), but THIS 15 ounce bottle stated that it held two servings – not one, which brings the sugar content up to a whopping 52 grams of sugar. Yes, the protein clocked in at 60 grams for the bottle, and yes, this sugar is “naturally occurring” versus added, but that much sugar from any source seems alarmingly high for one meal. The presence of this drink in the produce section (as opposed to perhaps being located with the juices, which is what it really is) might indicate to some consumers that this beverage is a healthy meal replacement, which it might be for some people. The next aisle over from produce is the cereal aisle. I have long avoided going down this aisle, especially when my son was with me, because I know that most breakfast cereals are major sugar delivery systems, as described above. What I didn’t expect was that there were over twenty different cereals, including “healthy” granola products, which include chocolate. Invariably, the chocolate versions of the cereals contained even more sugar than the non-chocolate versions. The oats and grains may be whole grain and organic, maybe the sugar and chocolate are too, but the cereals which claimed to be healthier still had fairly low levels of fiber and fairly high levels of sugar. Still, I had expected as much. What really proved shocking, however, was the dairy case. Much like the dairy case at Dollar General, there were several varieties of chocolate milk, chocolate almond milk, chocolate soy milk, etc. in the dairy case next to the regular milk, and all had higher amounts of sugar than their regular counterparts. But I was unprepared for chocolate yogurt. Chocolate. Yogurt. On the one hand – nirvana, chocolate flavored health food – yogurt is GOOD for you! Yay! Elation lasts mere seconds – as long as it takes to turn the package around and read the back. Nestled up right next to the puddings labeled “temptations” and “indulgent”, these yogurts are obviously intended to sway consumers to the healthier option. Healthier? The chocolate “indulgent” pudding had 18 grams of sugar per serving. The yogurt? Well, the “healthier” yogurt (with the candy coated chocolate sprinkles – you know the ones that say M? – there are other candies, too…some with nougat, some with cookies) has 30 grams – almost as much as a 16 ounce soft drink and over twice what is found in that pudding. Considering that the calcium levels are the same and that neither have any other appreciable nutrients (unless you count the live cultures in the yogurt…) you are probably better off handing your kid the pudding pack than you are handing them the yogurt. The other yogurts are not much better – having little more than sugar filled jam to stir in to them before eating. At this point in my shopping expedition, I have given up the idea of purchasing any actual food entirely. 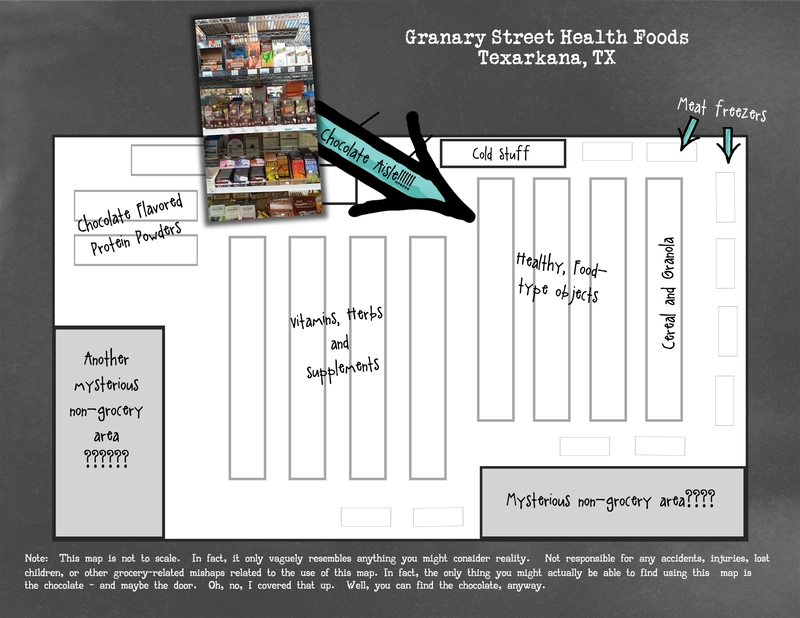 Instead, I began to map out the store – the WHOLE store. I made a sugar map – this was the point at which I abandoned simply looking for chocolate and chocolate displays and began searching for any kind of added sugar. As I made my way through the store, it began to dawn on me just how much candy and chocolate have invaded our grocery stores. That candy bar bouquet was just the beginning. I quite literally could not find a single aisle – NOT ONE AISLE that did not have some form of sugar added food. Canned fruits and vegetables – the fruit is canned in sugar syrup. Ketchup – yep, there is sugar in every bottle. Mayo – ditto. Low fat mayo – more. Soft drinks get the same amount of shelf space as ALL canned fruits and vegetables – not including the extra space for promotional products, which usually includes a display of soft drinks. Spice aisle – chocolate chips. 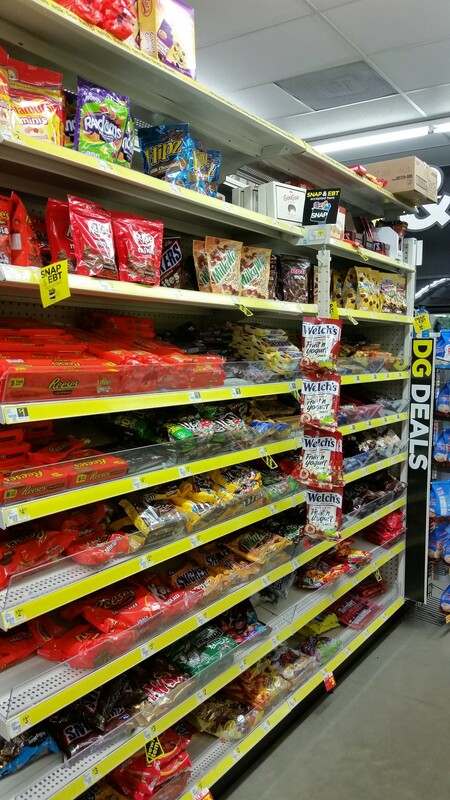 Non-food aisle – there is candy on every end cap of the non-food aisle section. Health and beauty – cough drops. And if you somehow manage to get all the way through the store without picking up any sugar….candy at every register – there is even a basket of s’mores bars sitting ON the shelf where you sign your receipt. The only section of the store which seemed a bit light on sugar – the frozen dessert section….most of the shelves were literally empty since Blue Bell was recalled a few weeks ago. Oh, and the produce section? Surely, the smoothie doesn’t count because its natural sugar. There is a seasonal display of salt water taffy right across from the bananas and yogurt covered pretzels literally IN the banana display. This is the exact moment when I decided those urban assault vehicle driving moms had it right. They DID need to prepare for battle before entering the grocery store. Heaven help you if you bring the kids inside with you. I digress. I am here for the chocolate. Even though there is already sugar or candy on ever aisle, there is still a dedicated candy aisle – for those shoppers who just need a little bit more. Here is where shoppers will find the bulk bags for sharing. This is also where the more discriminating shopper will find the “finer” chocolates. These chocolates are priced to indicate higher quality – and packaged for that, as well. No bright colors or “fun” fonts, these packages have decadent chocolate swirl backgrounds with sophisticated fonts – and they are mostly dark chocolates. As Robertson stated, “market research consistently claimed that dark chocolate was more popular amongst the higher social classes” (Robertson 29), apparently, this is still held to be true as the price of these bars clearly indicates they are meant for people who are willing to drop $3 a bar when there is a display of 10 for $10 around the corner. The bars of these finer chocolates are a bit larger, and the foil wrapping allows them to be rewrapped, indicating that these bars are meant to be savored over several occasions (or at least 2 as indicated by the serving size) or shared with your refined friends. For those who feel guilty about even this level of indulgence, the sugar free, low fat and low calorie chocolates brought to you by companies that want you to watch your weight or believe that cows can be skinny are nearby. The gifting boxes are nearby, as well. The entire end of the aisle is comprised of the gift giving boxes – indicated by the bow printed directly on the box. Of course, there are tiny single-serving size boxes if you want to give yourself a gift. You deserve it for making it this far through the store without buying anything with sugar…oh wait…. Exhausted, overwhelmed, frustrated, and just plain angry at the world, I pull into my favorite health food store. Well, it’s my favorite because it’s the only one in town. This little corner of Texas is just beginning to think that organic is pretty neat…baby steps. I am a frequent customer here because despite its higher prices (which they proudly tell you are lower than they would be if the store were located in Arkansas due to taxes and such), the meat and eggs are produced by local farmers and are grass fed and humanely raised by my neighbors – who I’d much rather support than some corporate farmer who has never seen dirt. At least, that is the belief about corporate farmers – I happen to have several relatives who work on “corporate farms”, so I know the reality is a bit more varied than is sometimes presented. All the same, I’d rather pay my neighbors and it’s healthier to eat less meat, right? Even in this self-proclaimed health food store, however, sugar is front and center. The first aisle you see as you enter the store is the candy aisle, and just past it is the baking/sugar aisle. But this sugar is just plain, natural sugar – no high fructose corn syrup or artificial sweeteners here. Sugar is “…generally recognized as safe…” according to the FDA. (Couzens) Or is it? More to the point – WHAT is it? Reading labels in this store should not be a lesson in chemistry – that is what you expect in a regular grocery store. And yet, it very quickly becomes apparent that there are more words for sugar than we may recognize. The gluten-free, nut-free, agave-free, sugar-free, granola has 18 grams of sugar – from the dates. Again, it’s not “added sugar”, its naturally occurring, but it is hard to know if this really makes a difference. The all natural cereal bars? The first ingredient in the decadent s’mores flavored ones is tapioca syrup and 10 grams of a 34 gram bar is sugar from that syrup – almost 1/3 of the total composition of the bar. Some bars state outright that they are sweetened with cane sugar or even organic cane sugar because consumers believe that if it’s organic it’s better for them. But others have brown rice syrup, more tapioca syrup or even evaporated cane juice. Isn’t that just sugar? The peanut butter aisle is even worse. Or should I say nut butter aisle, as peanuts are scarce here. While peanut allergies are a serious concern, their absence in a health food store would seem to indicate an overall “unhealthiness” which is largely undeserved. Of the numerous versions of nut butters on the shelf – several have chocolate or chocolate versions, and all of the chocolate versions have sugar. The organic chocolate hazelnut butter has 11 grams of sugar per serving and the first ingredient is cane sugar. The not-peanut peanut butter with chocolate had two different syrups listed on the ingredients list and that evaporated cane juice showed up in the dark chocolate almond spread. While most peanut butters do contain sugar, the chocolate versions tended to have higher amounts per serving – perhaps to compensate for chocolate’s bitter taste. As for the candy aisle, consumers fare a little better here – there are no bulk packages which might encourage or enable binge eating. The chocolate bars here are roughly the same size and same price point (in the $3 per bar range) as the “high end” bars at the regular grocery store, so they do not seem unreasonably priced in comparison. And these bars all come with assurances that the bars are making the world a better place. The labels of these bars all proudly bear the markings of various certifications – USDA Organic, Fair Trade, Rainforest Alliance, all marks which have been created to give consumers peace of mind about the products they buy. The belief is that these products will be better for the environment (organic does not allow for artificial pesticides or insecticides), healthier (ditto), and better for farmers in developing countries (no mention of family farmers in the US, though). But these labels do not mean that these chocolates are better for you in terms of the amount of sugar they contain. True, many of these are dark chocolates, so that does indicate lower levels of sugar. 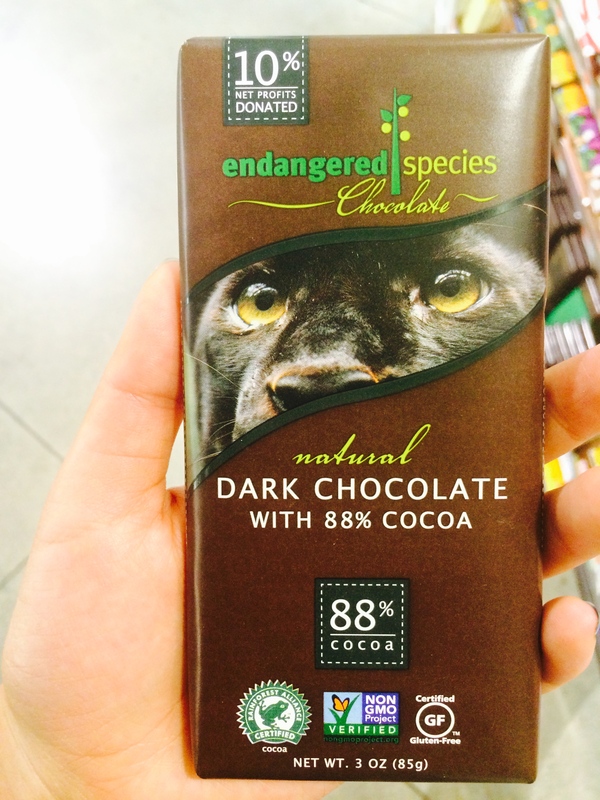 And, if you are truly concerned with the state of endangered animals, the chocolate with their picture on the package may make you feel better about buying a dark chocolate bar that is still 30% sugar. Here, however, the shopper has a few more alternatives for lower sugar chocolates. One bar is sweetened with stevia. It has a phenomenal amount of fiber at 12 grams and only 1 gram of sugar, and it is pretty good. The 40% cacao milk chocolate bar has a flavor much more reminiscent of dark chocolate. The other option is a bar sweetened with coconut crystals. It is labeled as low glycemic, but with 27 grams of sugar in a 64 gram serving it is 42% sugar. As I worked on my sugar map for the health food store, it became clear that sugar does occupy a bit less real estate here than in the other two stores, but only just slightly less. The sugar here is “all natural”, but there is little evidence to indicate that natural sugar is any better than other sugars. Some current research implicated high fructose corn syrup as the primary culprit in our nation’s declining health since “…the six-fold increase in cases of diabetes since 1985 exactly parallels the global increase in high fructose corn syrup (HCFS) consumption.” (Albritton 344) But, “…a growing body of research suggests that sugar (as well as) its nearly chemically identical cousin, HFCS, may very well cause diseases that kill hundreds of thousands of Americans every year…” (Couzens), suggesting that “all-natural” sugar is just as guilty. As for added sugar versus naturally occurring, most reports on healthy amounts of sugar discuss added sugar only. But, the health information on the packaging only labels total sugar, so it is virtually impossible to tell how much is added versus how much is natural – if that even matters. Albritton and Couzens’ reports both indicate that the studies we rely upon to tell us what is healthy and what isn’t cannot be relied upon due to the huge influence the sugar lobby has over research, funding, and marketing strategies. Add to that deception with the apparently highly addictive properties of sugar as reported by both authors, and the American consumer has little hope of navigating our way towards a more healthy diet – regardless of where she shops. Albertsons. Traditions and History. 2015. 11 May 2015. <http://www.albertsons.com/our-company/traditions-history/&gt;. Albritton, Robert. “Between Obesity and Hunger: The Capitalist Food Industry.” Carole Counihan and Penny Van Esterik, editors. Food and Culture: A Reader. New York: Taylor & Francis, 2013. 342-352. Couzens, Gary Taubes and Cristin Kearns. “Big Sugar’s Sweet Little Lies.” November/December 2012. Mother Jones. 11 May 2015. <http://www.motherjones.com/environment/2012/10/sugar-industry-lies-campaign&gt;. Dollar General. About Dollar General. 2015. 10 May 2015. <http://www2.dollargeneral.com/About-Us/pages/Index.aspx&gt;. 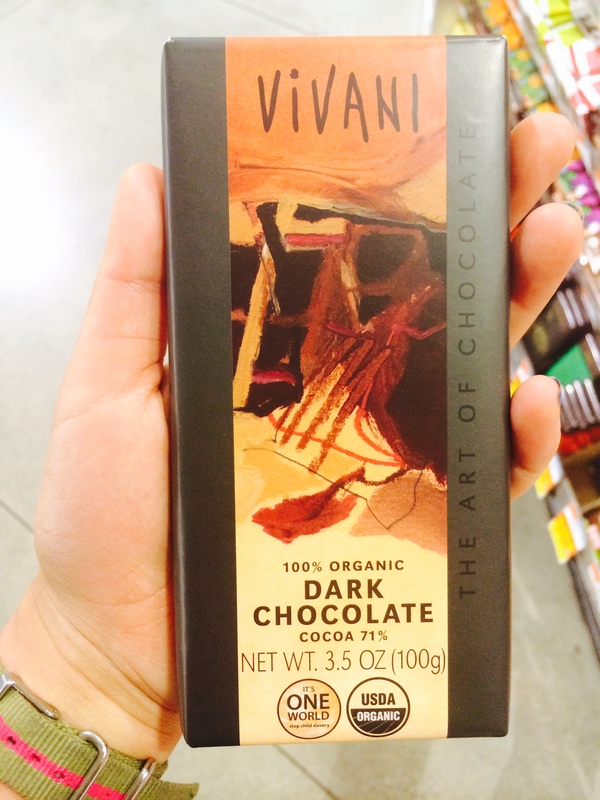 Fair Trade: An ethical revolution in the chocolate labor supply chain or a visual marketing technique? The world of artisan, high-quality chocolate, the likes of which can be found at specialty stores like Whole Foods, is not just selling you its chocolate. The packaging on these premium chocolate bars is overflowing with a multitude of seals and logos, from Fair Trade to USDA Organic to Gluten-Free. Whether this is a result of companies taking increased responsibility for labor practices and ethical concerns in their supply chain, a reaction to consumer demand for ethically-sourced products, or simply a convenient marketing technique, chocolate manufacturers have started incorporating new standards, which go beyond just taste, into their products and packaging in order to appeal to consumers’ moral sensibility. 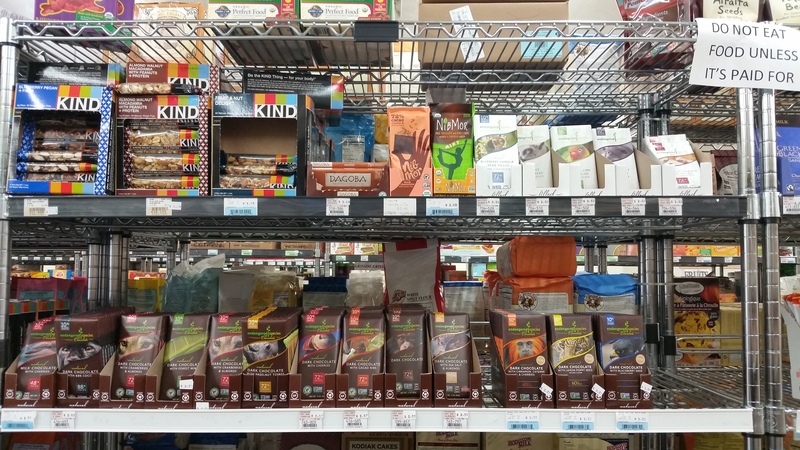 The proliferation of different licensing organizations, particularly around Fair Trade, has made chocolate consumption into a logo-oriented process, in which the number of seals on the packaging serves as a stand-in for the quality or morality of the product, regardless of what actual standards and real-world impact the product has. 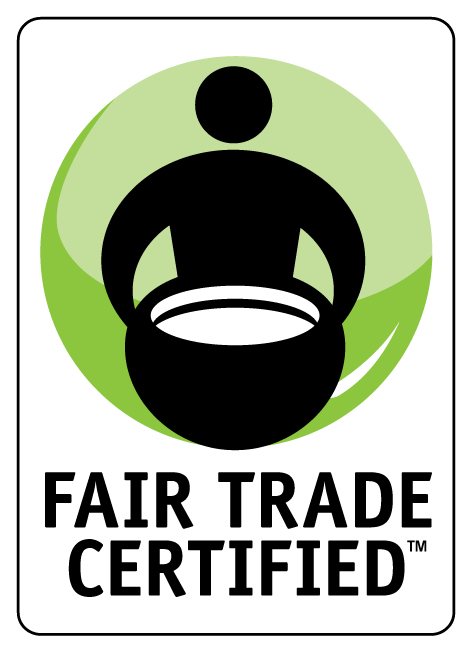 Two examples of the fair trade logo or seal, which appears on packaging and is now recognized by 50% of the population (Doherty 694). 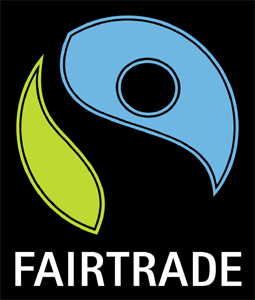 When I surveyed the chocolate bar selection at my local Whole Foods, Fair Trade was one the most common seals I saw on the packaging – its not surprising that retailers are inclined to include it, as the Fair Trade logo is now recognized by 50% of the population (Doherty 694). Fair Trade USA self-defines its organizational mission as helping “farmers in developing countries build sustainable businesses that positively influence their communities” (Fair Trade USA). The idea is that chocolate bearing a Fair Trade logo uses cacao produced by farmers who are “justly compensated,” which means a $200 premium per ton of cacao over the commodity price (Fairtrade and Cocoa). Basic fair trade principles include prompt payment of fair prices and wages, no child labor, safe working conditions, and investment in community development projects. In terms of economic theory, Fair Trade is an approach that perceives quality as the fundamental concept for the analysis of economic life, as opposed to neo-classical theory, in which the price mechanism encapsulates all the required information about a product (Renard 87). Instead of this price-oriented model, Fair Trade is, as Goodman describes it, an attempt to “reconnect producers and consumers economically, politically, and psychologically through the creation of a transnational moral economy” (Goodman 891). In order to do so, it must make capitalism appear “nice,” by fostering ethical relationships with growers through a range of economic and non-economic benefits, such as higher wages and community development. It must also expand into the mainstream of the “Euro-American consumption-scape,” getting its products into “coffeehouses, multiples, the charity shop, and the candy aisle at one’s alternative grocer,” like Whole Foods (Goodman 892). The fair trade model, at its core, has several implications: it reaffirms a belief in capitalism and the market as capable of just distribution by enabling farmers in developing countries to better compete within existing capitalistic structures; it promotes a shift away from pure aid and instead puts an increased emphasis on development and trade; and finally, produces the ideal of “individualized shopping for a better world” (Doherty 697), in which responsibility for the poverty of farmers lies not with international organizations or governments, but with everyday consumers and their personal choices. However, critiques of Fair Trade abound. Fair Trade retail sales in the US are over $1.5 billion, but there is little evidence of its impact, and it is unclear how much of that money reaches developing countries and the farmers themselves. In fact, a study conducted by the School of Oriental and African Studies in London found that “wages are typically lower, and on the whole conditions worse, for workers in areas with Fairtrade organizations than for those in other areas” (Cramer). Additionally, the study found that the “community” projects supported with funds generated by the “social premium” were not actually for community use – they give an example of one Fairtrade tea co-operative in which “the modern toilets funded with the premium were exclusively for the use of senior co-op managers” (Cramer). Finally, the marketing around Fair Trade is often misleading, particularly in the US where a product does not need to be comprised of 100% Fair Trade ingredients in order to utilize the logo on the packaging. Not only are the standards constantly changing, there is also an enormous proliferation of certifying bodies, from Fair Trade to Rainforest Alliance to Equal Exchange to Fair for Life, that it poses an immense challenge for consumers to be truly savvy and aware of the implications and standards of each when they’re faced with a display of chocolate packaging. Low uses the term “clean-washing” to describe Fair Trade’s “halo effect,” which is “derived by mainstream retailers who sell only a small percentage of fair trade products” but who gain the moral benefits across all their products, as well as the consumer confusion of products labeled “fairly traded” when they are separate from and do not conform to the principles of Fair Trade (495). The principles Fair Trade espouses are particularly appealing to Western consumers, because it plays into both the digital-age phenomena of “slacktivism” and the old trope of the white man’s burden. Low writes, “Ethical consumerism is a seductive concept because it suggests the transformative power of individual choice and action. It is also a message of inclusion – all consumers can, through the simple act of choosing one good in preference to another, create positive social and/or environmental change” (495). It is significant that the Fair Trade movement is prominent with artisan chocolate sold at an upscale, pricier grocery store like Whole Foods – there is no Hershey’s bar with a Fair Trade logo on it in your local CVS. Fair Trade is trying to target a specific white, upper-middle class demographic with growing pocketbooks and simultaneous growing awareness of their own privilege. Fair Trade offers a quick fix for assuaging feelings of guilt and a quick pathway to moral self-satisfaction. Similar to the modern phenomena of ‘slacktivism,’ in which people feel as if they’re contributing to a cause simply by posting or tweeting about it over social media, people feel that they are making a significant difference simply by purchasing one chocolate bar over another. One of the most prominent examples of slacktivism was the #KONY 2012 movement run by Invisible Children, which garnered incredible outpouring of support and attention on social media, but ultimately failed to mobilize much action on the ground and was forgotten in just a few months. Sarah Kendzior described the video for it in an Al Jazeera article as embodying the slacktivist ethos, with “viewers oblivious to a complex foreign conflict made heroic by watching a video, buying a bracelet, hanging a poster” (Kendzior). Ultimately, movements like Fair Trade and other slacktivist movements necessitate only minimal effort and superficial involvement, and require no real behavioral change or reduction in consumption. In fact, Fair Trade and other movements could even be worsening the problem: by clean-washing products and supply chains to appear as if they are very ethical and sustainable, they not only lull consumers into thinking the problem is being solved one chocolate bar at a time, they also make people ignorant of the large-scale structural violence and injustices that perpetuate inequalities between the global North and the global South and keep farmers in poverty and unethical working conditions. Thus, even if Fair Trade is not intended to be a one-stop-shop for all ethical problems in the cacao labor supply chain, its marketing is in fact doing quite some damage. Fair Trade’s marketing effectiveness hinges on its ability to convince you that your own individual choices in the grocery store are directly impactful in a big way, which is a ridiculous and almost patronizing notion. 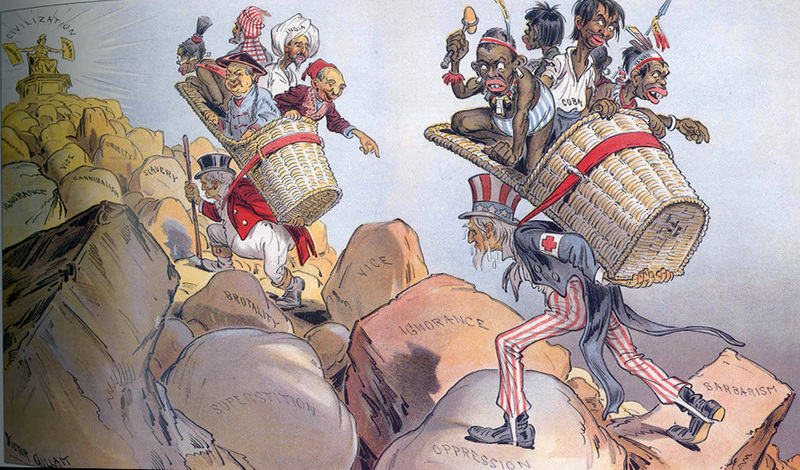 The trope of white man’s burden is repeated, in sending messages that it is up to white, wealthy consumers in America and Europe to shell out a little more cash in order to lift these struggling farmers out of poverty. In actuality, Fair Trade has little evidence of making a significant difference in farmers’ lives; perhaps all it lifts is the consumer’s own moral self-satisfaction. Even if this is casting Fair Trade in a harsh light, Low points out that “a key critique of modern “ethical consumerism” has been its individualized nature which pits individuals against global institutions to solve global problems” (496). Its lack of collective focus means it becomes a neutralized and ineffective campaign. The fact that Fair Trade is “forged semiotically” (Goodman) through the packaging, logos, symbols, and design of the products and their packaging, means that visuals become key to creating the networks and emotional connection between consumer and producer. What this meant for me, in my trip to Whole Foods, was a visual sensory overload on the chocolate packaging, overflowing with a variety of quality seals and logos, in an effort to convince me, the consumer, that sheer quantity was a reference to quality. 6 chocolate bars that I found at my local Whole Foods chocolate display, each with multiple certification seals. Some packages have 2-3 seals competing for the consumer’s attention. The different certifying bodies are also confusing – everything from Fair Trade, to Rainforest Alliance, to USDA Organic, Fair for Life, Non-GMO, Gluten Free, One World, Equal Exchange, and Whole Trade. The last is particularly interesting, as it is Whole Foods’ own self-created certification body, making it an excellent illustration of the redundant and unnecessary proliferation of certifications, simply for the sake of creating a busier product packaging. Equal Exchange is also interesting, because it clearly seems to mimic fair trade principles, and writes ‘fairly traded’ on the packaging, but like Low described with “clean-washing,” it isn’t officially affiliated or regulated by Fair Trade USA, so its standards and impact are unclear. Ultimately, it felt to me as if these certifying bodies and their stamp of approval had devolved into more of a marketing technique than a genuine effort to make an ethical product. For chocolate manufacturers, it should not be about collecting certification stamps like Boy Scout badges to be displayed on their packaging. 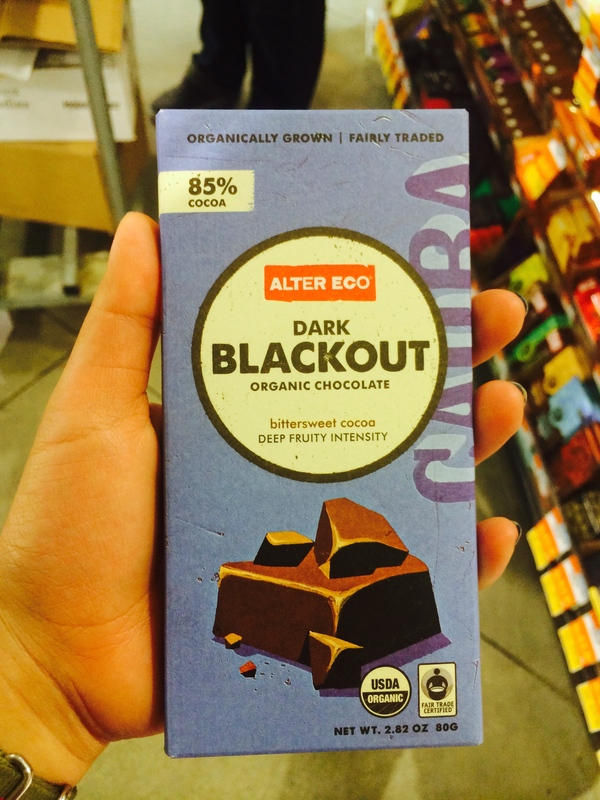 Nor should chocolate be about checking off a list of the trendiest consumer concerns of the day, like Organic, Gluten-Free, and Fair Trade, only to move beyond them when the consumers stop taking interest. If these certification seals are to have any real significance to customers, and more importantly, real significance to the farmers and the causes they claim to help, there needs to be a simplification, unification, and regulation of certifying bodies. The sheer quantity of organizations makes for a confusing consumer experience, and leads to customer confusion and disinterest. The lack of transparency and clarity about what each seal really means and what impact each organization really has renders these seals ultimately meaningless, because it makes accountability very difficult. Most importantly, chocolate producers cannot think only in terms of marketing. The certification seals should not be functioning as a marketing technique, as they currently do. And if these certification seals are here to stay as the industry standard for addressing ethics in labor supply chains, chocolate manufacturers should not be focusing on accumulating the most logos on the packaging, but about the actual quality, accountability, and impact of the standards themselves, as well as the quality of the product. Once that shift in thinking happens, I would hope that the quality and impact of the chocolate and its production process would speak for itself. Cramer, Christopher. (2014, May 24). Harsh truths are necessary if Fairtrade is to change the lives of the very poor. The Guardian. Doherty, Bob. (2006). “Radical mainstreaming” of fairtrade: the case of The Day Chocolate Company. Equal Opportunities International, 27(7), 693-711. Fairtrade and Cocoa: Commodity Briefing. Fairtrade Foundation. August 2011. Goodman, Michael. (2004). Reading fair trade: political ecological imaginary and the moral economy of fair trade foods. Political Geography, 23, 891-915. Kendzior, Sarah. (2012, April 5). The subjectivity of slacktivism. Al Jazeera. Low, William. (2005). Has the medium (roast) become the message? International Marketing Review, 22(5), 494-511. Marchmont, Sarah. (2010). Some caution that fair trade isn’t always fair to the worker. Medill Reports Chicago. Renard, Marie-Christine. (2003). 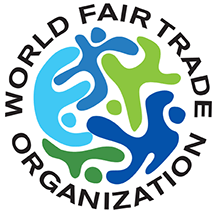 Fair trade: quality, market and conventions. Journal of Rural Studies, 19, 87-96. When the Europeans arrived in Meso-America, they encountered as perhaps the most important and desired foodstuff of the Aztec “Indians” a bitter and energizing drink derived from the seeds of the cacao plant. But a half-millennium later, in cafes and bakeries and grocery shops around the world, chocolate has become synonymous with sweetness and indulgence, and no longer with energy, health, vigor, and vitality. What accounts for this radical shift in the way that chocolate is perceived and consumed? While innovations in chocolate manufacturing and increases in the availability of sugar in the developed world allowed for the possibility of chocolate to be transformed from a cleansing beverage into a sugary dessert, the ability to make chocolate into candy cannot alone explain its transformation. Instead, it was competition from two other caffeinated beverages, coffee and tea, that drove the long-term process of converting chocolate from an invigorating food to an ultra-sweet indulgence. When chocolate was first introduced into Europe during the 16th century, it remained, according to Marcy Norton, strikingly similar to the drink enjoyed by the Indians of the New World. “Europeans in both the New and Old World learned to like chocolate in its full Mesoamerican complexity, adopting the whole spectrum of cacao beverages that surrounded them” (Norton). Over time, Europeans began the process of adding sugar and other spices to create unique blends of chocolate, which grew in popularity alongside the explosion of sugar onto the European scene in the 18th and 19th centuries (Coe and Coe, 114-115). 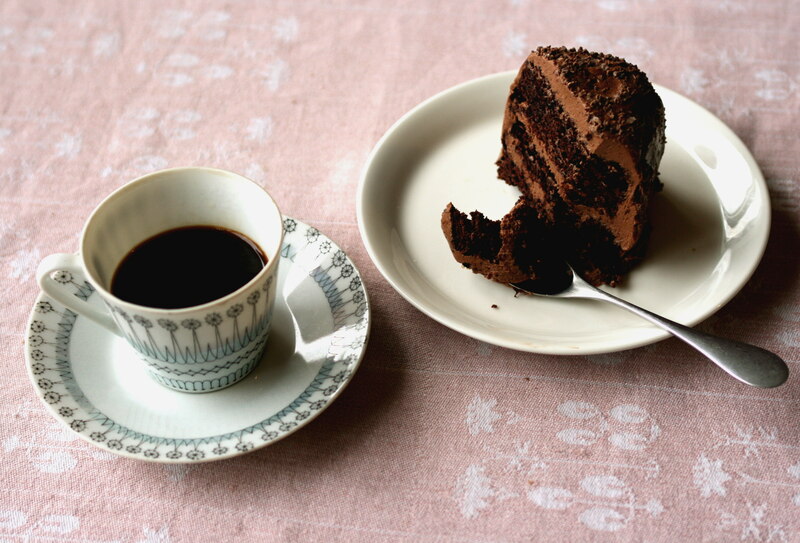 Importantly, the introduction of chocolate in Europe coincided with the introduction of both coffee and tea into Europe, which would have arrived in Europe as luxury goods just after chocolate in the early 1600’s (Reich). 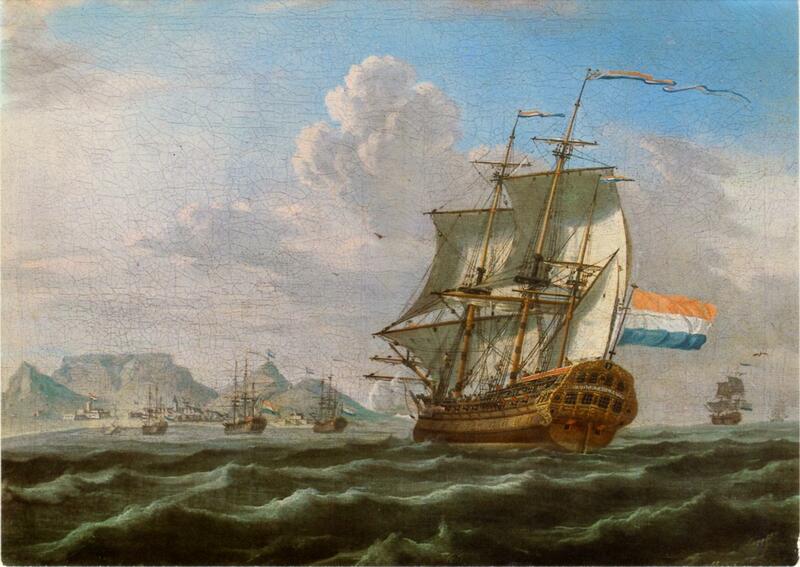 Figure 1 shows a picture of a Dutch ship from the time period, which might have carried coffee or tea from Africa and Asia into Europe. I believe that it was the competition with these stimulant drinks that caused chocolate to transform into becoming primarily consumed as a sweet drink or candy by the early 1900’s. The energizing properties of coffee and tea have caused these beverages, in a manner very similar to that of chocolate, to serve important functions in virtually every society that has been exposed to these drinks. 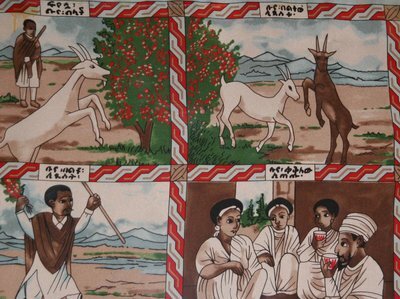 Anna Reich describes the cultural importance of coffee in Ethiopia, where one legend tells of a herdsman who discovered the invigorating qualities of coffee when he observed his goats running around wildly after consuming the fruit of the coffee bush. Both tea and coffee have historically played roles similar to the one that chocolate played in Meso-America and early Europe; they each were consumed in liquid form, often at warm temperatures, and each was thought to have medicinal and stimulating properties. It comes as no surprise, then, that coffee and tea largely supplanted chocolate as the go-to stimulant drink for modern Europeans and North and South Americans. Still, we may ask why it came to be that chocolate became so closely associated with sweetness and candy, while the other two drinks, which are also frequently accompanied by sugar, remain seen more as stimulants than as sweets. Part of the answer may relate to the naturally higher caffeine contents of coffee and tea; alternatively this difference may stem from the innovations in chocolate production that allowed it to be consumed as a solid food. Whatever the case may be, chocolate’s shifting role over the past half-millennium is due in large part to its association with the other two major stimulant drinks, which have combined to change how we perceive and consume chocolate. Coe, Sophie D. and Coe, Michael D. The true history of chocolate. 280 p., (2013). Much of our knowledge about the centrality of cacao in the lives of ancient peoples is derived from analysis of original texts. The most comprehensive and original written record about ancient Mayan civilization is found in the Dresden and Madrid codices, very few of which are still intact today. The codices are pictographic texts that can be subjectively interpreted by modern scholars to infer about aspects of Mayan life. Yet, since these glyphs do not possess the raw communicative power of modern language, interpreters must form of a web of associations in order to understand the role of different objects in Mayan customs. The importance of cacao can be determined from these glyphs because of its frequency of appearance, the objects surrounding it in the glyphs, and its centrality in interactions among Mayan deities. This string of links is key to understanding the reverence with which ancient people viewed cacao. 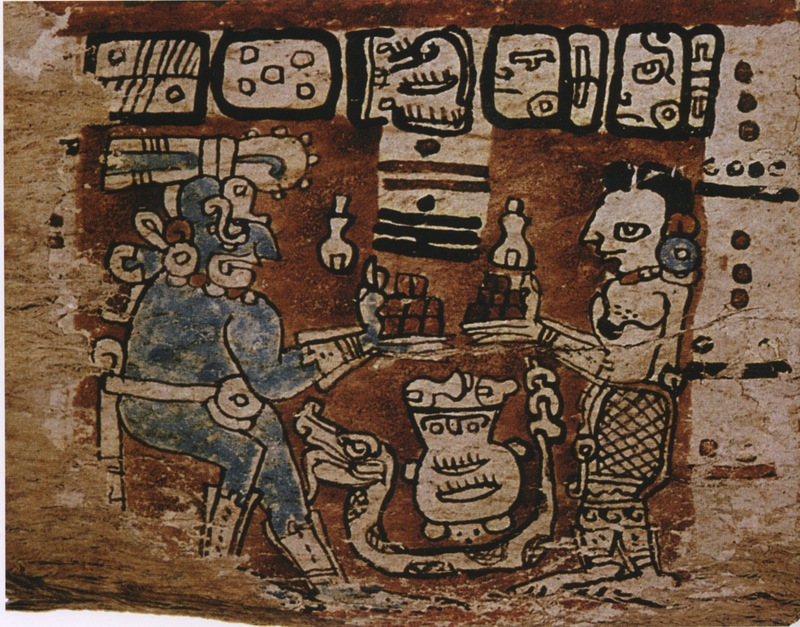 Two deities exchange cacao. This scene is depicted in the Madrid Codex. 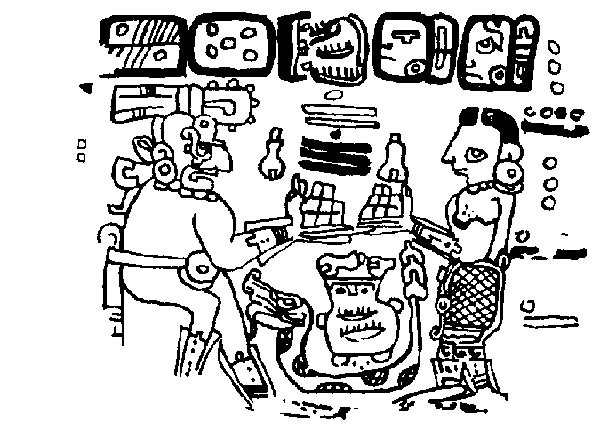 The two most complete Mayan codices are the Dresden Codex and the Madrid codex, and cacao appears multiple times in both. It appears in numerous forms, such as the pods, seeds, trees, or chocolate products (Dreiss and Greenhill 35). The appearance in multiple forms is significant to understanding Mayan culture because it showed their understanding of and their appreciation for the natural process that produces the goods in their world. While depictions of chocolate products alone would imply limited understanding of the origins of cacao beverages, the presence of cacao in all stages of its development in the codices shows that the Mayan people felt a connection to the substance that exceeded bodily and culinary pleasures. Cacao, in addition to being present in all forms, also surfaced in many ritualistic contexts in the codices. It is associated with blood-letting, eating, rain, sun, life, and death, therefore present in most facets of life (Grivetti and Shapiro). It is these associations that provide modern interpreters with hints as to the significance of cacao in the lives of Ancient Mayans. 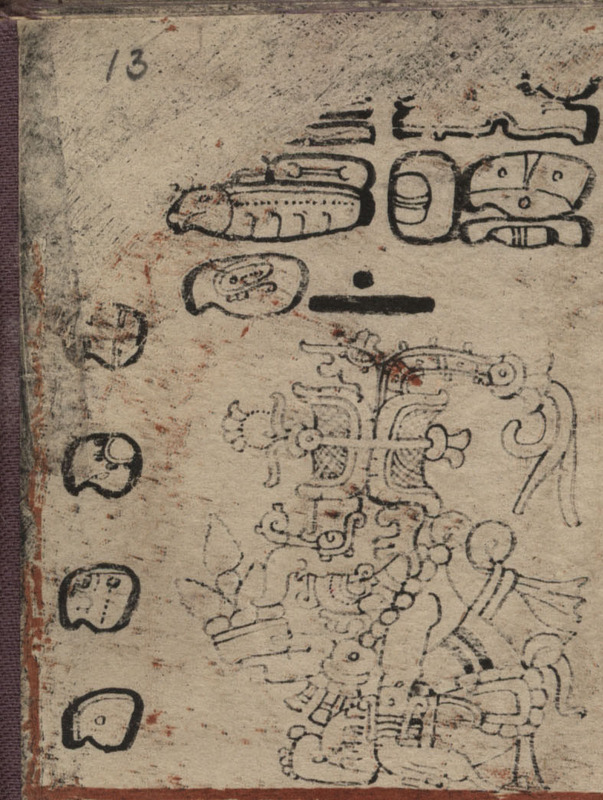 In the glyphs of the Madrid Codex, cacao can be seen paired with the quetzal bird in scenes involving one or more deities, and this association adds to the significance of cacao. The quetzal is a species that still exists today and once made its home in the highland Maya area. Its bright plumage produced feathers that were a prized item for trade and were depicted on the heads of deities in ancient glyphs (Grivetti and Shapiro). The feathers were also worn by rulers as part of a headdress. The quetzal appears in the Madrid codex above two cacao trees and the god Nik, the priest god. The pairing of cacao and the quetzal naturally invokes circular logic as to whether the presence of the quetzal increased perceived value of cacao or vice versa, but it is undeniable that both were prized by the Mayans. Their presence together in deeply ritualistic scenes strengthens conviction in the value of cacao. The connection between cacao and the gods is the one that is most significant and prevalent in the codices. In one scene, the moon goddess IxChel exchanges cacao with Chac, a god that influences the rain. The rain god, Chaak, holds a bowl with cacao in his hands and wears a headdress of quetzal feathers. This scene is from the Dresden Codex. 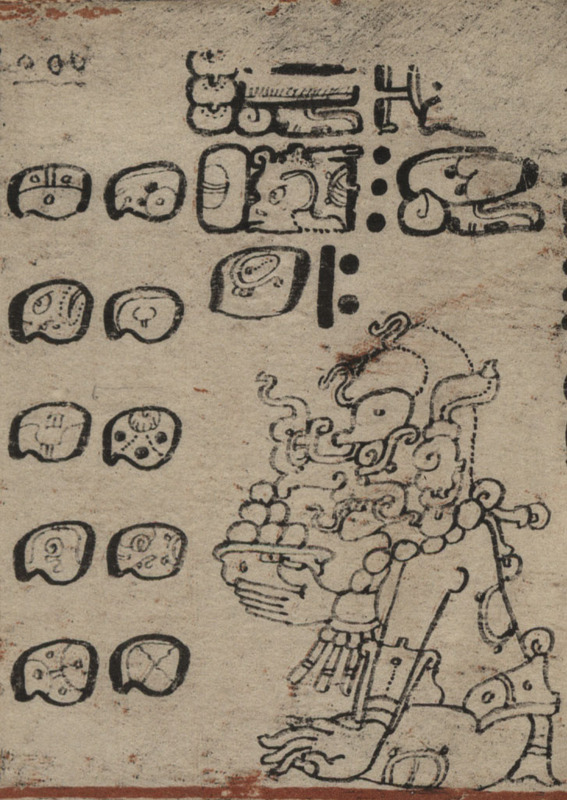 In another from the Dresden Codex, Chac holds a container of cacao beans next to the god of war and sacrifice, who is also offering cacao pods (Dreiss and Greenhill 35). In the Madrid Codex, the gods perform blood-letting rituals, piercing themselves and allowing the blood to flow upon cacao pods (Dreiss and Greenhill 38). These scenes are fascinating because they show that cacao was not only viewed as a connection between humanity and the divine but also as a unit of exchange among the gods as well. The Dresden and Madrid codices are evidence that cacao was fundamental to the lives of the Mayan people. The ubiquity of cacao in these scenes is important, but it is its associations with valuable goods such as quetzals and its role among the gods that elevate cacao to highest regard. Dreiss, Meredith L., & Greenhill, Sharon (2008). Chocolate: Pathway to the Gods. University of Arizona Press. Grivetti, Louis E., & Shapiro, Howard-Yana (2011). Chocolate: History, Culture, and Heritage. John Wiley & Sons. During class lectures and discussions we explored the responsibility of chocolate companies to actively fight against unethical labor practices that have become commonplace in the chocolate industry. The general sentiment of our class was one of shock in light of how chocolate companies have consistently failed to take appropriate action against the likes of child labor and slavery used to harvest the raw cacao which is eventually made into chocolate. Take for example, the Harkin-Engel Protocol, an agreement signed by international chocolate companies in 2001 to fight the worse forms of child labor. 10 years later, after extending the commitment three times, it is unclear whether the protocol reduced child labor in cocoa production. It seems surprising that chocolate companies could do so little when each of my classmates, as I would imagine any chocolate consumer, seemed disgusted by corrupt practices within the industry. My paper is motivated by how ethical concerns motivate consumer purchasing habits, if at all. These ethical concerns extend to the environmental impacts of chocolate manufacturing that the organic movement addresses. Can we really put all the blame on chocolate industry giants when consumers are unwilling to fight against the problem with their wallets? The documentary, “The Dark Side of Chocolate” concludes with the film maker biting into bar of chocolate with a troubled look on his face, having just revealed that child trafficking and similar atrocities went into producing the bar. How can one expect chocolate companies to take action when its consumers are funding the exploitation? I decided to survey friends about their attitudes on chocolate preferences. I wanted to see if they practiced “conscious reflexivity,” or the basing of personal food choices on their perceived consequences (Guthman). Guthman applies this idea to supporters of the organic food movement but it can be extended to that of fair trade. I was also curious to see if supporters of these socially conscious foods, as well as gluten-free and vegan foods have, as Guthman might describe, “[conflated] aesthetic reflexivity with political reflexivity,” favoring them in part because of a perceived trendiness over “industrialized” foods. The experiment was split into two parts, a chocolate tasting and a post-tasting survey. In all, 12 people participated in this survey. The purpose of the tasting was to allow participants to sample fair-trade, organic alongside non-organic non fair-trade chocolate. This way, both bars would seem familiar and allow for participants to isolate opinions on organic and fair trade food without respect to flavor. If participants were only exposed to organic fair-trade chocolate, they could have based their decisions off of false expectations of non-organic, non-fair trade chocolate, or vice-versa. Both samples were purchased at Trader Joe’s. They are both dark chocolate, comprising of 72% cacao content. The bars were intentionally similar to encourage participants to focus on the organic and fair-trade properties of the bar. One is advertised as a Belgian Dark Chocolate Bar while he other is advertised as a Swiss Dark Chocolate Bar. 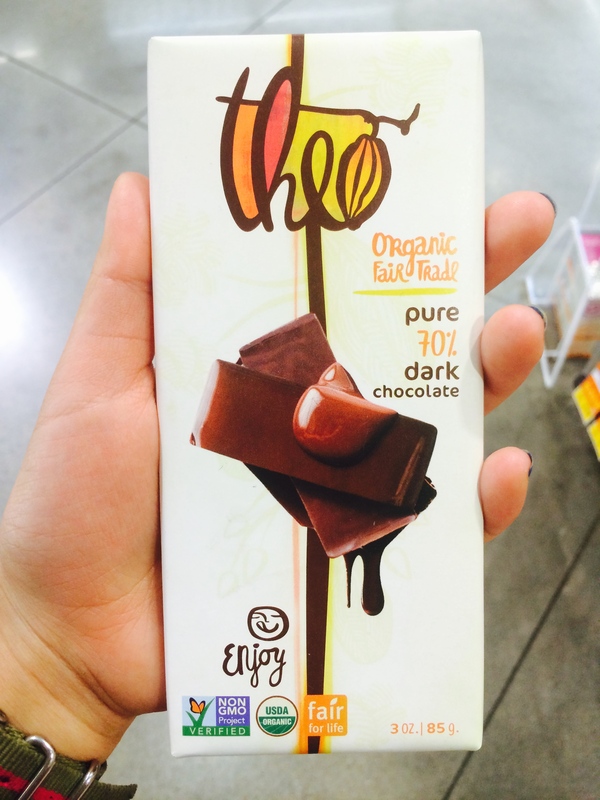 The Belgian Dark Chocolate Bar has the USDA Organic certification and the Quality Assurance Certified Organic certification on the front. Although it does not have a fair trade certification on the front, the back has text describes the purpose of fair trade chocolate and asserts that this bar offers “high quality Belgian chocolate, as well as the confidence of knowing the ingredients were purchased in a socially responsible manner.” It is unclear why this bar lacks an official Fair Trade USA certification, which necessitates certified organizations to adhere to ethical practices including prompt and fair wages for farmers, no exploited labor and safe working conditions. For the purposes of this experiment, I chose to believe in Trader Joe’s promise that the cacao that went into this bar at least offered “small-scale growers a fair price for their harvest.” It’s also notable that the front of the non-fair trade, non-organic bar advertises itself as gluten-free and vegan. 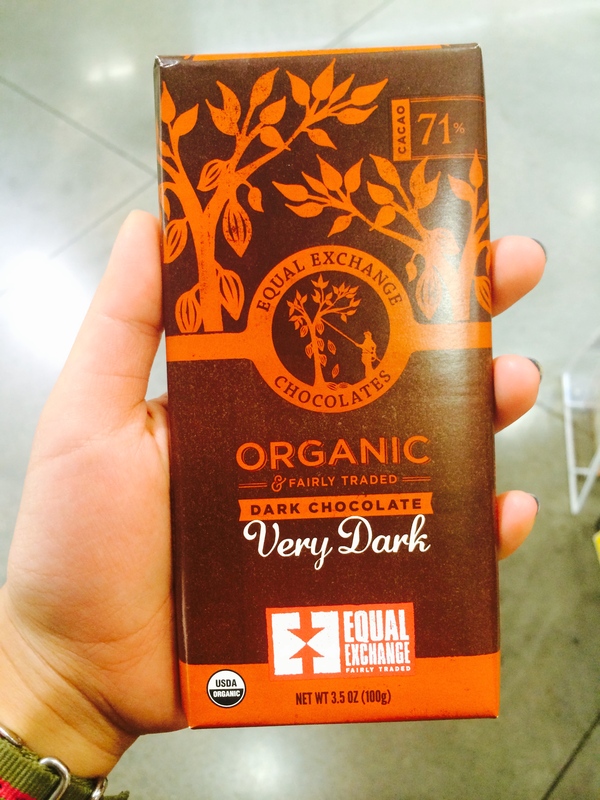 Interestingly enough, this bar costs $2.29 while the fair trade organic one costs $1.99. Before having participants taste the bar I asked which bar they would purchase had they seen them side by side at whole foods. This choice should be based solely on an examination of the front and back of the bar. The purpose of this question was to see how influential marketing techniques, such as design and display of certifications were in consumer choice. The consumers were also made aware of the price of the bars. 9 participants chose the Belgium Bar (organic, fair-trade), while the other 3 chose the Swiss Bar. Participants commented mostly on the design of the chocolate bar. Some enjoyed the simplistic design of the Swiss Bar while others thought the decoraive elements on the Belgium bar was more “eye catching.” 12 out of 12 claimed that the design of the bar influenced their choice. 8 out of 12 said they were influenced by the price of the bar. 6 out of 12 said they were influenced by the organic certification labels. One participant claimed, “USDA organic makes me feel better about myself.” 2 were influenced by the fair trade text on the back. 1 was influenced by the nutritional information (the Belgium Bar has 10 fewer calories). This side-by-side evaluation neglects some other important factors that may influence shoppers decision to buy organic, fair trade in a shopping scenario. These variables include shelf layout factors, price level, price promotions, and consumer demographic. A study even differentiates the purchasing tendencies between buyers or organic vs buyers of fair trade products (Herpen, Nierop, Sloot). For example, the number of facings, or the strategy of pulling all the products to the front of the shelf, is positively correlated with purchasing fair trade products but not organic products. Price difference with the leading brand is also influential for fair trade brands but not organic brands. Even something as nuanced as placement at eye level and clustering of items benefits both types of products. These sustainable products also sell better in areas with an older customer base and one with a higher education level. It’s surprising how marketing tactics can influence buyers who strive make socially conscious buying decisions. I offered participants both samples of chocolate, but did not state which one they were tasting. Participants preferred the Swiss Bar over the Belgium one, 8 to 4. They described the Swiss Bar as “ sweet, smooth, velvety, and creamy,” with a “better consistency” compared to the Belgium bar. The Belgium bar was described as “fruity and flowery” with a good combination of bitter and sweet. It was described as not overly sweet. Participants agreed that the Swiss Bar was definitely creamier, and more similar to a milk chocolate while the Begium Bar was “definitely a dark chocolate”. When asked if they could identify which was the organic, fair trade chocolate, all the participants claimed that the taste of the bar gave no indication. 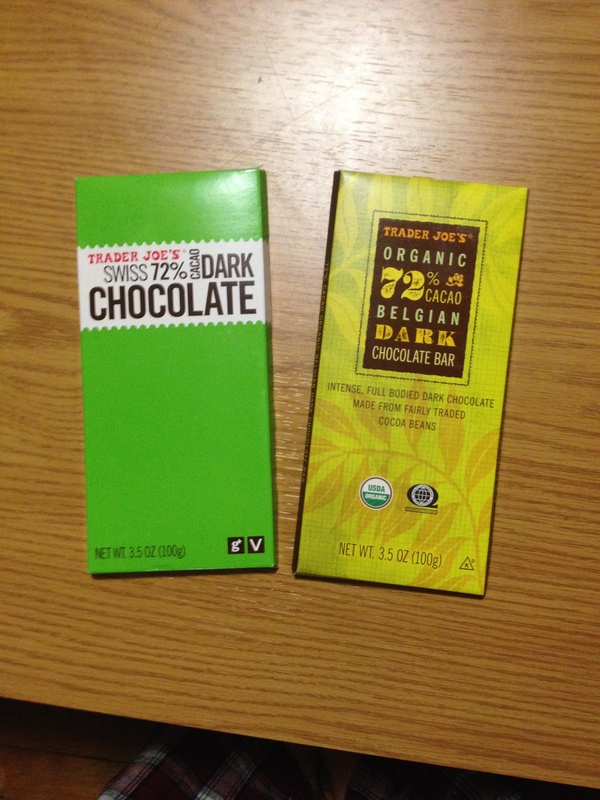 Participants noted that while both bars had a distinct flavor, neither could be discerned as organic nor fair trade. By putting tastes of the bars on equal footing, participants could base their survey answers on only the organic and fair trade aspects of the bar. I asked participants how much more they would be wiling to pay for their favorite bar if they knew it was fair trade. Their answers are below. The x-axis represents cents more, and the y-axis is relative frequency. Similarly, I asked participants how much more they would be willing to pay for their favorite bar if they knew it was organic. Their answers are below. The x-axis represents cents more, and the y-axis is relative frequency. 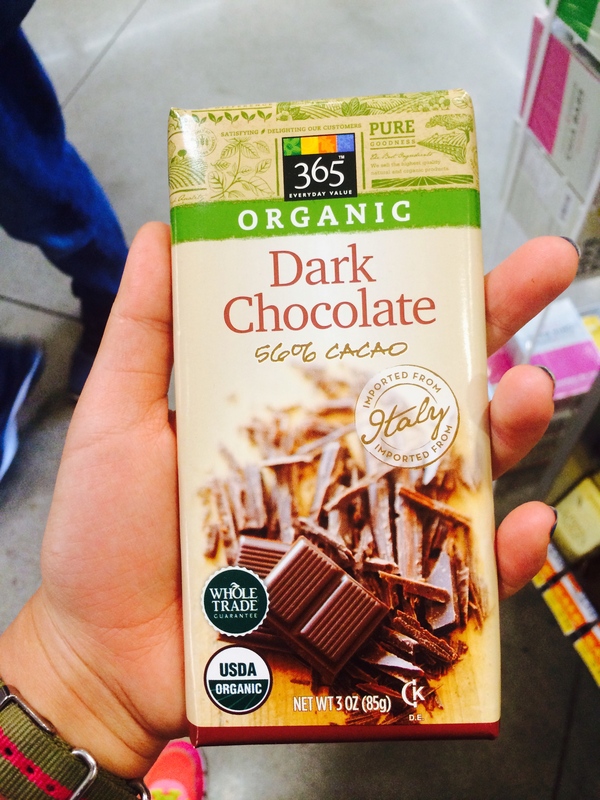 Participants described that while they may be willing to pay more for organic or fair trade chocolate, other considerations may take precedence. For example, if a participant knows they he or she particularly likes some brand of chocolate, they will be more likely to buy that brand, regardless of fair trade or organic status. Unsurprisingly, some participants commented that their current financial situation would also have an impact on how likely they would be to pay extra. A study reveals the trend that while consumers who actively consume fair trade are likely to remain loyal during an economic recession, those who only occasionally buy fair trade will decrease their purchases of fair products and become “significantly more price aware” (Bondy, Tierney, and Vishal Talwar). None of the participants of my study identified as regular consumers of fair trade or organic products. In fact, when asked, only 3 of the 12 were certain what fair trade even meant. Common responses ranged from “I don’t know what it means, but it sounds good,” to “I have a vague idea.” All participants were somewhat familiar with the guarantees of organic food, citing pesticide-free and artificial fertilizer free growing methods. However, some cited that organic foods were “more whole,” or “healthier”. In response, I decided to show participants two short clips that outlined the goals of fair trade and organic, shown below. After the participants watched the video, I asked them again how much they would be willing to pay for fair trade and organic foods. As shown below, many decided that they would be willing to pay more now that they knew the goals of fair trade. None of the participants were willing to pay more than they originally stated for organic. This suggests that educating consumers on what it means to be a fair trade product is important for them to make an informed decision. Participants were willing to be more consciously reflexive, but did not realize the unfair practices that went into making a chocolate bar. Finally, I asked participants to comment on the Vegan and Gluten-free labels on the Swiss Bar. Most were surprised because they didn’t expect that dark chocolate would have either gluten or non-vegan products. Most participants also believed that gluten-free and vegan foods were “healthier.” In fact, it’s this false conviction that gluten-free products are “healthier” that is a top motivation for buying these products, leading to a 12% increase in gluten-free products from 2011 to 2012 (Watson). The participants were correct in stating that dark chocolate lacks both gluten and animal product. The labels on the bar are part of a trend of promoting gluten-free organic foods to draw in customers that are concerned with being healthy. Although the sample size for my study was small, and not reflective of the entire chocolate eating population, it did reveal two important points. Firstly, while consumers were willing to pay more for fair trade and organic chocolate, they were much more likely to put other influences before the social good the products offer. While it is easy for people to point fingers at the giant chocolate companies for exploiting labor, we must first be willing to prioritize fair labor practices as consumers. Secondly, many participants seemed to lack an understanding of what fair trade meant. It is vital that consumers become informed on the goals of fair trade so that they can use their purchasing power for good. While chocolate may be more accessible today compared to hundreds of years ago, it can still be considered a luxury good. Consumer awareness is crucial with every purchase in order that the consumption of a luxury good does not infringe on another person’s basic human rights. Bondy, Tierney, and Vishal Talwar. “Through Thick and Thin: How Fair Trade Consumers Have Reacted to the Global Economic Recession.” Journal of Business Ethics 101.3 (2011): 365-83. Print. Guthman, Julie. Food and Culture: A Reader. Ed. Carole Counihan and Penny Van Esterik. New York: Routledge, 2013. Print. Herpen, Erica, Erjen Nierop, and Laurens Sloot. “The Relationship between In-store Marketing and Observed Sales for Organic versus Fair Trade Products.” Marketing Letters 23.1 (2012): 293-308. Print. Watson, Elaine. “Gluten-free Myth Busting: There Is No Biomarker for Gluten Sensitivity, Says Researcher.” Food Navigator USA. N.p., 22 Oct. 2012. Web. 07 May 2014. Anybody that you talk to probably has a different relationship with chocolate. With the many different forms of chocolate, the way in which people use chocolate on a daily basis will differ from person to person. In order to get a better understanding of how people have different relationships with chocolate, I conducted an interview with a close friend of mine. He is a student-athlete at Davidson college and identifies as a “chocolate lover”. At the conclusion of the interview I gained a much better understanding of how the role of chocolate in his life changed at different stages of his life. This was his very first encounter with chocolate. Growing up baseball was his favorite sport and he had always heard the cliche saying that milk was important for growing and getting stronger so this particular commercial really resonated with him. The role of chocolate in his life at this moment comes to no surprise if one knows the history of chocolate. Nesquik was a powdered form of chocolate that could be mixed with milk or water to create a chocolate drink at anytime. It was based of the invention of a man by the name of Henri Nestle. In 1867 Nestle discovered a process to make powdered milk by evaporation; when mixed with water, this could be fed to infants and small children (Coe, 250). In addition to this new found way of making chocolate, companies also were trying to push chocolate as being a part of a “balanced breakfast”. As Telpner outlines and many other advocates against chocolate milk as a recovery drink point to, the sugar content in chocolate milk is way above the daily recommended amount in just one bottle, which can be finished pretty quickly (Telpner, 2011). Also, most chocolate milk usually has added artificial flavors and other ingredients that are not healthy for the body (Telpner, 2012). In conclusion, the relationship my friend had with chocolate at different stages of his life almost perfectly matched up with the common trends that chocolate was going through at the same time. At the time when chocolate milk was seen as a good breakfast option, and brands like Nesquik were really popular is when he used it the most for breakfast. As he grew older he learned about women and their love for chocolate, which was at the time and currently still is a huge stereotype in the chocolate industry. Finally, as a highly competitive athlete, the more recent stereotype of chocolate milk as great recovery drink option after a tough workout has changed the way in which he uses chocolate currently. The impacts of the historical trends of chocolate have undoubtedly had a significant impact on his relationship with chocolate. Telpner, Megan. “Chocolate Milk Is Not A Sports Recovery Drink.” – Making Love in the Kitchen. N.p., 2011. Web. 09 May 2014. “Athletes Refuel with Chocolate Milk.” World Dairy Diary. N.p., n.d. Web. 09 May 2014. O’connor, Anahad. “REALLY?” The New York Times. The New York Times, 17 July 2006. Web. 09 May 2014. Chocolate has a rich history through out the world in many different places. In some regions of the world, chocolate brings about emotions of happiness, joy, and satisfaction. There are other regions that do not have the same feeling. 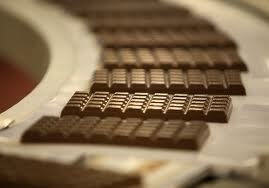 Some regions of the world have suffered from the production of chocolate. Kids have been force to work at unethical or no wages at all. The point is that chocolate is a product that has a personal relationship with individuals: some are good, some are bad, but all are unique. Chocolate has been a significant factor in many historical societies, such as the Mayans and many nations along West Africa as well. In many of these cultures social class played a major role in the relationship, or lack there of, one had with chocolate. Today, the relationships people have with chocolate still have a lot to do with class and upbringing. Historically chocolate has been a product that was meant for the elite. Originating in South America, chocolate, which was sometimes served as a beverage, was a commodity that mostly people of upper classed received. Many lower class people were not privileged to have this. As chocolate began to spread across the world into Europe this was definitely still the case. The Europeans discovered chocolate when upon reaching the Americas. They brought chocolate back to Europe, adding to the ingredients to satisfy their taste. In Europe chocolate was a product that was not for common people. It was a luxury. People of high status were privileged with the luxury and others were not, often times not being able to afford such goods. For this essay I interviewed 9 individuals. Two people identified as upper class, five identified as middle class and two as working class. This is important because it alludes to the atmosphere and culture in which each was raised. Everyone I interviewed that was independent adults said that they were still in the same class as they were growing up which is also good for consistency in their culture. The first person that I interviewed was someone that was from the working class and had a moderate appreciation for chocolate but was not a huge chocolate fan all together. “Who doesn’t like chocolate?” I asked. She replied with a response that I was not even thinking about at the time saying, “Well as a kid my family was broke. Things like chocolate and candy were something that we could always do without and mostly did.” She continued to talk about how her favorite things to eat now as an adult was vegetables, fruits, and a few main dishes that were served to her a during younger days. Her relationship with chocolate sparked a question of people’s relationship with and attitude towards chocolate in relation to their class. Many of the people, both middle class and working class, considered chocolate as a luxury or at least not as an essential, such as food. It was interesting to see how the approach to the questions was different. The middle and working class people decided it wasn’t a luxury for its lack of necessity but the upper class decided the other way around because of its use. Historically, chocolate has been both. Motecuhzoma II an Aztec leader used chocolate as money. Money is definitely a luxury. It is said that he banked 40,000 xiquipilli or 960,000,000 cacao beans (Dr. Martin, Lecture 5 Slide 12). At the same time, the warriors would make chocolate tablets to eat while on the road to give them energy to continue on. I think the way that the meaning has split over time is a telling factor to the different cultures that are present. Chocolate has been around for a very long time. In different cultures, environment, and individual experiences chocolate has been a representation of a multitude of different aspects of culture, one being class. As you can see throughout some of the interviews conducted, presently chocolate still in some situations can represent class. Today, due to mass production and the cheap, affordable prices chocolate has grown from an undeniable luxury to an affordable snack for most people to enjoy. The enhancement of preserved, transportable foods help the spread of chocolate in to what it is today. Big named companies made it affordable to all. Goody, Jack. Cooking, Cuisine, and Class: A Study in Comparative Sociology. Cambridge: Cambridge UP, 1982. Print. Nesto, Bill. “Discovering Terroir in the World of Chocolate.” JSTOR. University of California Press, n.d. Web. 08 May 2014. Laude, Rachel. “In Praise of Fast Food.” Utne. N.p., n.d. Web. 08 May 2014. “Chocolate Production Continues At Cadbury During Hostile Takeover Bids.” Zimbio. N.p., n.d. Web. 08 May 2014. “Trader Joe’s Mexican Chocolate + How to Make Mexican Hot Chocolate.” LA Weekly. N.p., n.d. Web. 08 May 2014. 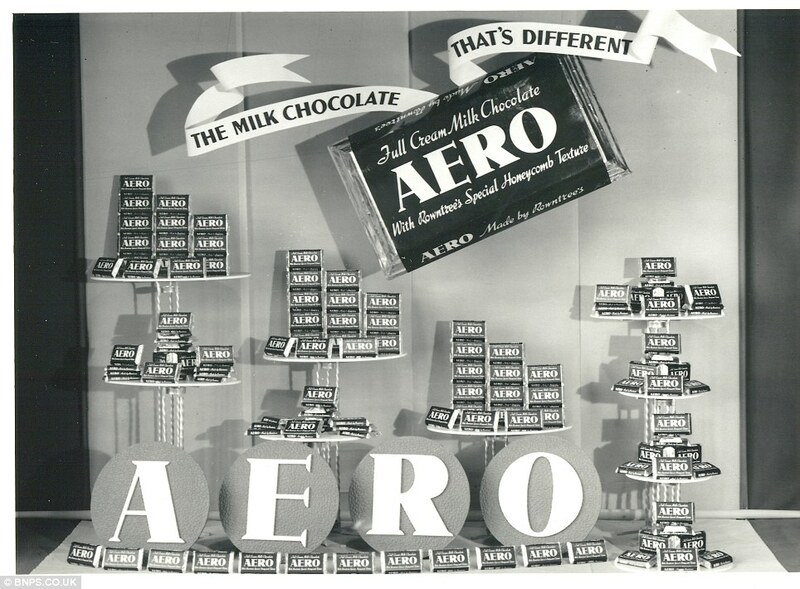 The development of chocolate as a commercial good and its mass production through factories spurred the strategy behind its sale through the use of advertising and marketing campaigns. However with great changes in the industry over the last century, there are both new opportunities and ordeals in selling chocolate. Greater data and studies have improved the scientific and creative approach to marketing all consumer product goods, and considerations related to health, pricing, gender norms, and the accuracy of claims present new and growing challenges to the marketing of chocolate. Consumer research and the art of marketing was largely instigated by the Rowntree company at the beginning of the 1930s. Facing competition from several other chocolate producers, Rowntree struggled to keep up with sales of Cadbury’s Dairy Milk. Company leadership recognized that “consumers could exercise a large degree of preference over which non-essentials to buy or could decide against purchasing non-essentials at all… its demand had to an important extent to be created through advertising” (Fitzgerald). As sales continued to falter, Rowntree turned from individual campaigns to consumer surveys to guide their marketing policies. By incorporating sales research into their marketing mix, Rowntree was able to boost sales dramatically, targeting campaigns to consumers. Still, chocolate manufacturers were dependent upon “shopkeepers to stock and adequately display their goods at the point of sale. A large number of outlets and visibility stimulated the impulse buying of confectionary…” (Fitzgerald). Creative display aids, posters, and packaging helped increase brand visibility and draw attention to the product in stores. After its start, marketing was deemed “essential” to the success of a firm, trading serendipity for strategy. The chocolate industry harnessed the power of economic and psychological study to drive its success going forward, incorporating new research into tried-and-true methods related to product branding, packaging, and placement in stores. Marketing and targeting are apparent even in chain pharmacy and convenience stores such as CVS, evidencing the broad and growing availability of “luxury” chocolate products. While exact product placement varies from store-to-store even within grocery and pharmacy chains, the general formula remains the same to maintain the consistency and quality of store atmosphere. Aisle organization generally remains fixed to improve the ease of the shopping experience for regular customers. Thus, extrapolating the findings for a chain store can give a convincing picture of the broader regional or national market. One of several CVS Pharmacies in the Cambridge, Massachusetts area, the Harvard Square location on Massachusetts Avenue provides an interesting and compelling case study for the marketing and sale of chocolate nationwide. Conveniently located on the first floor of the multi-story establishment, the confectionary aisle contains both season and non-seasonal bagged candies, chocolates, magazines, and travel items. Rotating end-cap displays showcase premium chocolate selections, and chocolate bars are also located at checkout kiosks and occasionally on the second-floor in the giftwrap and personal hygiene aisles. Evidence suggests that these products are not only intentionally placed around the store, but in specific areas of shelf space, pointing to the power of chocolate interests in dictating shopkeeper arrangements of store layouts. This setup is underpinned by decades of research and study. Placing products in stores which have broad exposure and are conveniently located is key to the success of any consumer product company. According to research from KPMG, an audit, tax, and advisory firm, “Convenience is a major driver for chocolate lovers, who want to grab a bar from a local store or throw a multi-pack into the trolley during a weekly shop.” Compared with other products, chocolate is an affordable luxury that is most often an impulse purchase, picked up when buying other necessities at grocery stores and pharmacies more often than at specialty chocolate stores. Survey research from Canadian Consumer found that “shoppers are most likely to trade-up on chocolate when it comes to buying indulgent groceries,” with nearly 2 in five shoppers saying they buy premium chocolate regularly or frequently, providing opportunity to reach and up-sell chocolate to those shoppers in stores they already visit. 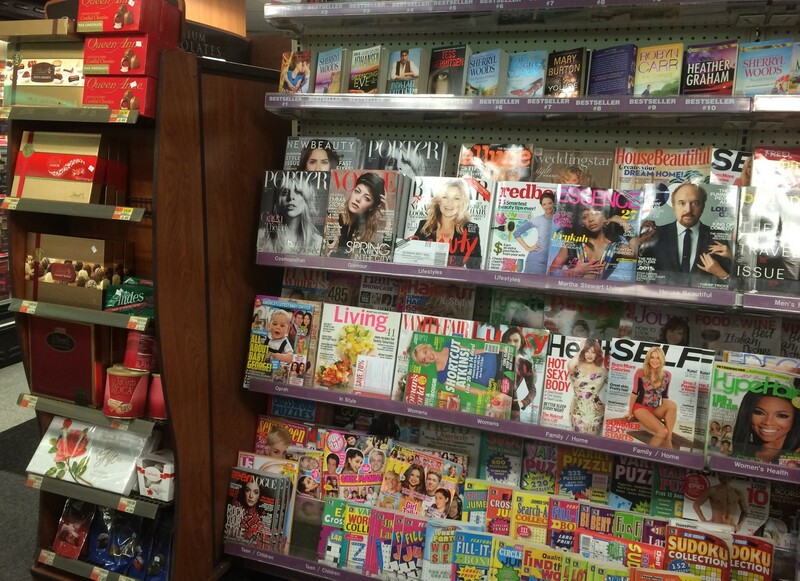 Placement on shelves has also been widely studied. According to the National Institute of Health, the middle shelf is the highest selling area, though the Economic Times evinces that “lower shelves hold definite merchandising opportunities for children. Chocolates showed an increase in the range of 14 to 39 per cent in their sales as they were clearly visible to the ‘junior’ target group.” Consumer experience is further influence by the feel, language, and design of brand display aids that complement store arrangements, with different display units and surroundings which hope to make the customer “feel they are making a special purchase” (ISM). 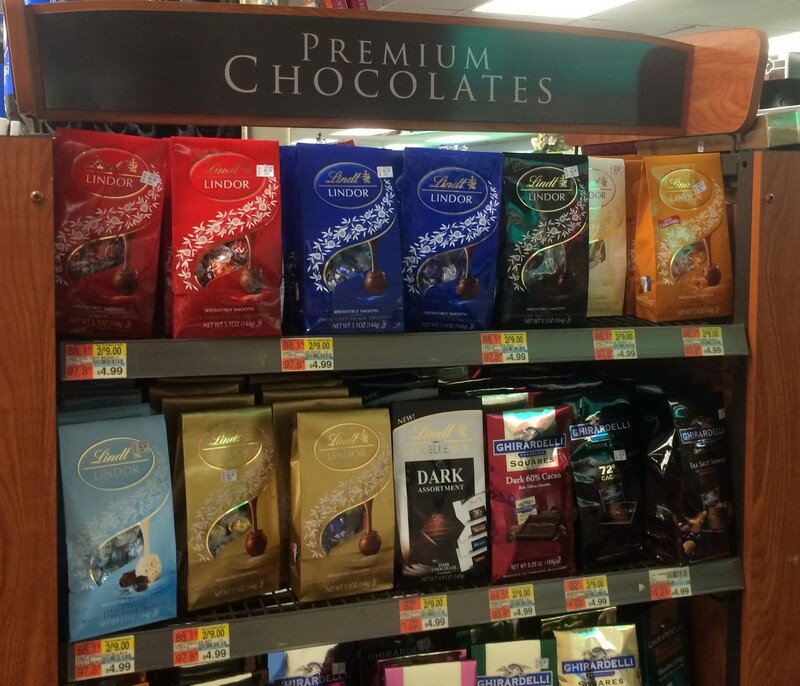 At the CVS in Harvard Square, the laminated wood end-cap is currently used to display the higher price-point “Premium” chocolate bars from Lindt, Godiva, Ghirardelli, Ritter Sport, and Ferrer Rocher from four to five dollars. Products such as Brookside’s dark chocolate and fruit are also placed on multiple shelves in the same aisle at different heights to improve visibility. Additional register and seasonal chocolate displays saturate the shopper experience, ensuring that buyers come into contact with chocolate at least once in their visit to the store. Interestingly, the arrangement of different products together can further influence buying behavior. A study by Ram Bezawada et al. on “Cross-Category Effects of Aisle and Display Placements” found that there is an “affinity” between different types of products which are more likely to be purchased together, influenced by display proximity, special promotion, or separate psychological factors. In sum, “retailers can use the results of affinity analyses to plan more effective in-store merchandising and promotion strategies to increase their customers’ cross-buying of products, leading to greater purchases at their stores.” Marketing items, in tandem, then can improve store’s bottom lines. The connection between women and chocolate advertising is well documented, and the cross-marketing of certain items with chocolate in stores such as CVS further underscore this perceived connection by marketers. The location in CVS places the chocolate bars and sampler boxes closest to the store’s magazine and Harlequin romance novel display within the aisle, and again together at the point-of-purchase at the register. Assuming that the proximity of these items is strategic, it is apparent that magazine and chocolate bar purchases are often made together. Studies of chocolate scents confirm that chocolate is “congruent” with books in the food, drink and romance genres (Time Magazine). Most strikingly, special promotions and in-store placement also group chocolate with feminine hygiene products, playing into the widely-perpetuated belief that chocolate helps to alleviate- or at minimum- brighten cycles. The tie between women and product placement comes full circle when considering the target audience of chocolate promotions in grocery stores and pharmacies. Despite the gains made by women over the last several decades, the domestic sphere remains dominated by women. According to a She-conomy report, women account for 85% of all consumer purchases, still making 93% of all food purchases. The Harvard Business Review suggests that for marketers, “food represents one of the largest opportunities. Women are responsible for the lion’s share of grocery shopping and meal preparation. Food is also one of consumers’ most important budget items, one that can be adjusted but never eliminated.” Thus, with women’s proclivity and supposed addiction to chocolate, marketers place chocolate in places that women in particular come into contact with. Responsibility for shopping squeezed by increasing involvement in the labor market and less time makes women perhaps even more likely to indulge in the convenience of chocolate when they encounter it. As indexed by C. Nuttall in Industrial Chocolate Manufacture and Use, women are more likely than average to eat premium chocolate brands (index: 124), and more likely to eat chocolate in general (index: 106); homemakers index at 113 for heavy consumption of chocolate. The recurring mention and admitted preference for “premium” chocolate evidences the fact that “Chocolate is becoming increasingly premiumized…as consumers develop a taste for everyday glamour” (KPMG). 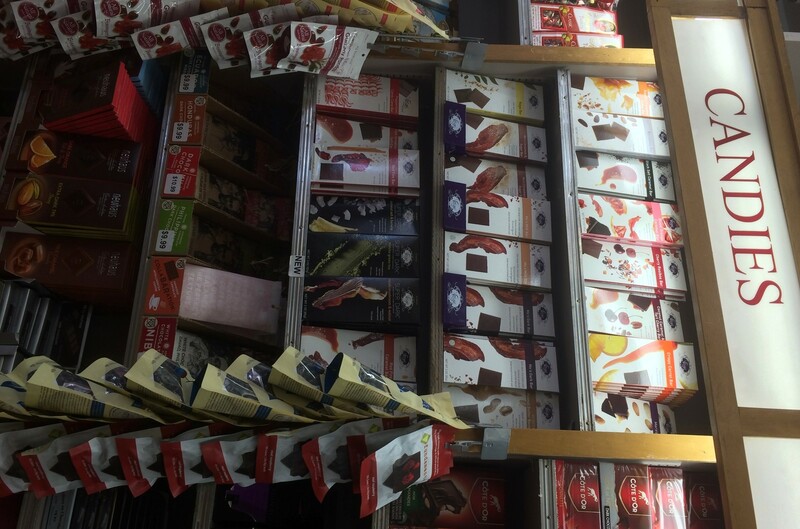 The marketing of premium chocolates in chain stores such as CVS stands in stark contrast, however, to the selection of premium chocolates in gourmet and specialty stores such as nearby Cardullos. Averaging a far higher price-point around or above seven dollars a bar, the chocolate at Cardullos is marked by labels boasting fair-trade, organic, and award-winning distinctions, a much different and greater variety of brands and flavors compared with its mass-market neighbor. Both the store surroundings and the higher price strengthen feelings of chocolate sold here as an experience and true luxury. The distinction of quality in spite of similar premium claims between the chain and specialty store betray some of the marketing challenges faced by the chocolate industry. While the chocolate sales have remained buoyant in a struggling market, with premium and dark-chocolate sales growing as a proportion of the market, the concept of quality remains hazy. Without any agency or industry watchdog, the definition of “premium” remains undefined and broadly applied as discussed in Raising the Bar: The Future of Fine Chocolate. One producer admitted that he believes “There is too much marketing and hype… It is marketing that is driving many of the decisions consumers make… Marketing is sometimes more important than the flavor and quality of product because the consumer is not in a position or doesn’t take the time to distinguish quality chocolate.” Rather than informing the consumer, marketing can manipulate opinion and buying behavior in favor of “big chocolate” over small-scale operations with little or no marketing budget. The sale of premium, dark chocolate to women in pharmacy settings as heart-healthy indulgences also demonstrates the strength of marketing in shaping public opinion regarding a specific product, even when science behind such claims is unproven. The price disparity obvious between premium chocolate at CVS and premium chocolate at Cardullos demonstrates another challenge for the industry going forward, bringing to light the near 100 percent price difference between big and small chocolate brands and questioning whether true premium chocolate manufacturing can be sustained by the market when it does not have the mass-market audience of other brands. The development of industry standards and codes of conduct may help to alleviate some of these concerns and increase transparency both for producers and consumers. Bezawada, Ram, S. Balachander, P.K. Kannan, & Venkatesh Shankar.“Cross-Category Effects of Aisle and Display Placements: A Spatial Modeling Approach and Insights.” Journal of Marketing, Volume 73, Number 3. May 2009.Web. 6 May 2014. Bush, Joe. 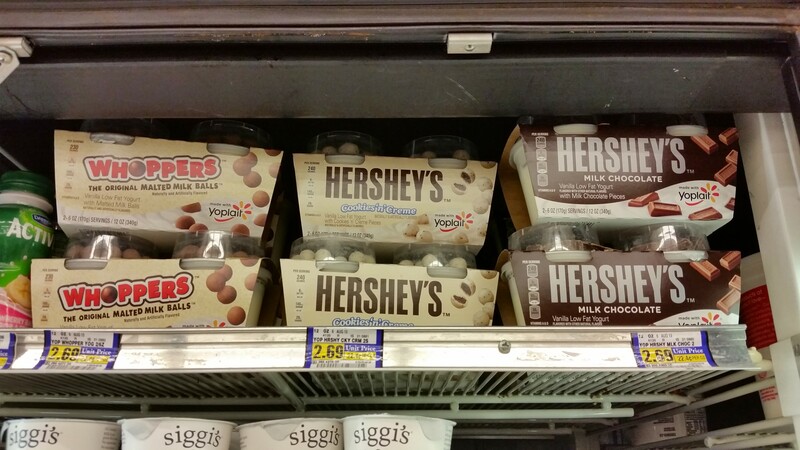 “Chocolate Sales Boost Confections.” Convenience Store Decisions. 29 Feb. 2012. Web. 5 May 2014.
de Cunha, Sylvester.“The Science Behind Shelf Placement.” The Economic Times. 20 Jan. 2010. Web. 6 May 2014. Fitzgerald, Robert. “Rowntree and Market Strategy, 1897-1939.” The Business History Conference. 1989. Web. Gavaghan, Julian. “From Pastilles to Present: How Henry Rowntree (and Some Beloved Sweets) Turned His Family Firm into a National Icon over 150 Years.” Mail Online. 25 Jun. 2012. Web. 5 May 2014. “Global Chocolate Market.” KPMG. 31 Oct. 2012. Web. 6 May 2014. Godiva Seeks a Move to the Supermarket in Effort to Get Women to Eat More Chocolate. WSJ. 29 Nov. 2011. Film. King, Valerie. 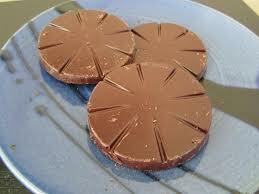 “Study: UK Consumers More Likely to Indulge in Chocolate than Anything Else.” Candy Industry. 12 Mar. 2014. Web. 6 May 2014. “MARKETING TO WOMEN QUICK FACTS.” She-conomy. Web. 6 May 2014. Nuttall, C., and W. A. Hart. “Chocolate Marketing and Other Aspects of the Confectionery Industry Worldwide.” Industrial Chocolate Manufacture and Use. Ed. S. T. Beckett. Springer US, 1994. 362–385. link.springer.com. Web. 5 May 2014. Sigurdsson, Valdimar, Hugi Saevarsson, and Gordon Foxall. “BRAND PLACEMENT AND CONSUMER CHOICE: AN IN-STORE EXPERIMENT.” Journal of Applied Behavior Analysis 42.3 (2009): 741–745. PubMed Central. Web. 6 May 2014. “Smart Business: How CVS Boosted Chocolate Sales This Year.” Image. N. p., n.d. Web. 5 May 2014. Waxman, Olivia B. “The Smell of Chocolate Could Help Boost Bookstore Sales.” Time. Web. 6 May 2014. Williams, Pam and Jim Beer. 2012. Raising the Bar: The Future of Fine Chocolate. Over the course of the past decade, the chocolate industry in the United States has experienced a revolution, with the rise of a new generation of chocolate makers and a new kind of company: bean-to-bar. Unlike traditional, large corporations that are removed from various parts of the chocolate making process, bean-to-bar chocolate companies actually make their chocolate all the way from the raw cacao beans to the molded bar. And there has been momentum in the movement. From 2004 to the present, the number of bean-to-bar chocolate operations has grown at a rate of over 60% a year, popping up across the United States, and around the world (Desai & Bruno, 2013). This is significant because the work is not easy and many bean-to-bar owners take a big risk when they choose to join the industry. Yet for Shawn Askinosie, the founder of Askinosie Chocolate, this was a tradeoff that he was willing to face in a quest to produce a quality, sustainable, ethically produced chocolate, which was ultimately worth more to him than the profits that large industrial chocolate corporations enjoy. Now, Askinosie Chocolate has become a model for success in the chocolate industry, particularly for those attempting to address ethical concerns and invest in farmer outcomes, suggesting that the value of a chocolate bar cannot always be measured by the number of labels and certifications stamped on its wrapper. Askinosie Chocolate, which is classified as craft chocolate, is made on a small scale by a family run business in Springfield, Missouri. After working for 20 years as a criminal defense attorney, Shawn Askinosie gave up a successful career and comfortable lifestyle to pursue a passion for chocolate, building a business from the ground up in Springfield, Missouri. However, it was not just any chocolate business. Shawn had a vision to create a “product of change”—a chocolate product that could have a hand in impacting lives in a positive way, largely through social and ethical responsibility, and more importantly, through strong personal relationships (askinosie.com). To do this, Shawn wanted to have a hand in every step of the process, which meant physically traveling to the four locations he would be sourcing cocoa from: Ecuador, Honduras, Tanzania, and the Philippines. 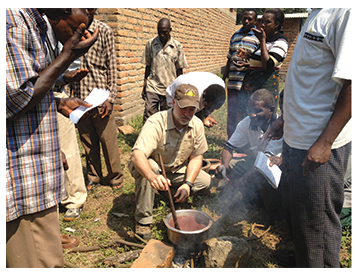 Shawn leading a workshop for farmers in Tanzania on how to roast the cocoa beans and make cocoa liquor, hot chocolate, and tea from the cocoa bean shells, thereby allowing this group to develop a fuller understanding of flavor possibilities, which depend on how they treat the bean post-harvest. For Shawn, developing this sense of understanding about how the quality of the cacao bean ultimately affects taste and manufacturing is important, and opens the doors for dialogue and feedback with farmers in the long-term. According to a statement by Shawn on the company’s website “the greatest opportunity and challenge has been weaving social responsibility into everything we do; it’s not just a buzzword, it’s who we are…Askinosie Chocolate was born committed to fairness, sustainability, minimal environmental impact and community enhancement. [and] those commitments will be in place as long as the company is” (askinosie.com). So how exactly has Askinosie Chocolate committed itself to these values? It is no secret that the ethical issues surrounding the chocolate industry are numerous, ranging from child labor, to slavery and exploitation, to the perpetuation of systemic poverty in the ‘global south’ (Baradaran & Barclay, 2005). Thus, what is perhaps most striking about Askinosie Chocolate is that, when examining the wrapper, you will not find a single label signaling ethical or sustainable practices. In other words, there is no Fair Trade label, no Equal Exchange label, no Certified Organic label, no Non-GMO label, or any of the countless others that have been created and approved in recent decades. 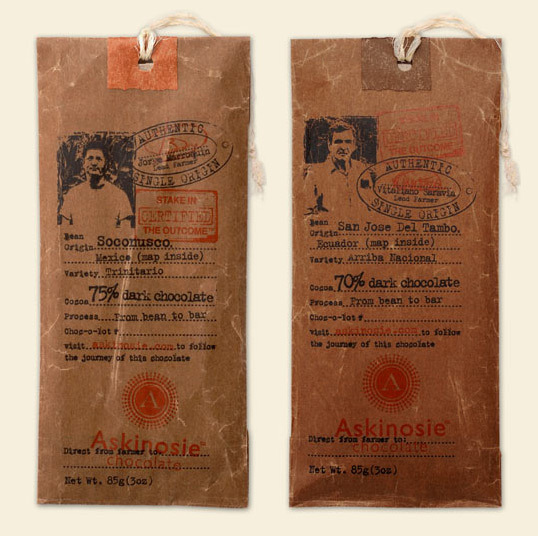 Some examples of Askinosie Chocolate wrappers. Note the lack of labels. And yet, according to the founder of Askinosie Chocolate, they company goes above and beyond what many of these labels stand for. Take the Fair Trade label, for example. Representing one of the most well-known initiatives in the United States intended to fight unfair labor practices within the chocolate industry, Fair Trade USA seeks “to empower family farmers and workers around the world, while enriching the lives of those struggling in poverty” by using “a market-based approach that empowers farmers to get a fair price for their harvest, helps workers create safe working conditions, provides a decent living wage and guarantees the right to organize” (fairtradeusa.org). However, Fair Trade has its limitations. While the organization has set out to achieve commendable and valuable goals, in the end, there has been little evidence to show that Fair Trade has made any substantial impact in the lives of farmers and workers around the world. While little of the money from Fair Trade reaches the developing world, even less reaches the farmers cultivating cacao beans. As a matter of fact, for a farmer making 5 bags of cocoa per year, their annual profit through Fair Trade only increases from about $375 a year to $400 a year—hardly enough to bring them out of poverty (Martin, 2014). Furthermore, there have been critiques about the Fair Trade marketing system, specifically regarding secretive and misleading selling techniques and concerns that the rich are simply using the label to get even richer as it allows them to increase their prices (Elliot, 2012). As noted in the Congressional Quarterly, “some consumers may be disturbed to learn that as little as 10-percent of the extra price they pay for a fair trade cup of coffee goes to the grower, according to some estimates…because wholesalers, processors, branders and retailers each take a little of the extra price for themselves” (Glazer, 2007). Along with Fair Trade USA, there are countless other “fair trade” labels, pointing to a larger problem that there is no one clear, single definition or understanding of what fair trade is. With these issues in mind, Askinosie Chocolate has chosen to engage in “Direct Trade,” which is a sourcing practice through which Shawn Askinosie actually travels to areas of Ecuador, Honduras, Tanzania, and the Philippines to directly source the cacao beans. In other words, Askinosie Chocolate “is 100% traceable…they name of every farmer in the groups [they] work with and can trace the beans directly back ot the farmers from whom [they] purchased them” (askinosie.com). On his trips, Shawn meets with the farmers he will buy from, giving him the opportunity to provide them with direct feedback, suggestions, and requests on the way they grow, ferment, and roast the beans, and ultimately building long-term, ongoing relationships that allow him to remain engaged in the early parts of the chocolate-making process. Shawn meeting with his farmer group in Cortes, Honduras to profit share, taste some chocolate, and plan for the next shipment of beans. However, while Direct Trade has been shown to be relatively effective in improving the livelihood of individual farmers—especially when buyers like Shawn are paying several times more than the Fair Trade price—there is still a common critique that Direct trade does not enable the community in the same way as Fair Trade, which works strictly with cooperatives of farmers and workers, allowing them to work together to solve problems, share knowledge, and improve their communities in a unique way. However, Askinosie Chocolate has allowed for the best of both. This is because, along with enabling these farmers to better help themselves and their community through this Open Book Management approach and profit-sharing strategy, Askinosie Chocolate has also implemented community-based programs for sustainable development in each community it sources from. In Davao, Philippines, and Kyela, Tanzania, for example, Askinosie collaborates with local schools’ administration and PTA to develop a Sustainable Lunch Program for the students. What this means is that, Askinosie “purchases a product harvested by the PTAs, sells it domestically in the United States, and returns 100% of the profits back to the PTA so they can source local food to provide lunch to every student for every school day” (askinosie.com). In other words, they are merely providing the PTAs access to the market, thereby allowing them to feed their own community’s children in a way that was not previously available. Thus, not only is Askinosie enabling individual farmers through profit sharing and incentivizing them to invest in farm infrastructure and sustainability to create a quality product, they are simultaneously empowering those within the wider community more directly through programs that help them help themselves. Of course, at the end of the day, these efforts will not be enough to change the world. As a small scale bean-to-bar company selling individual bars for a minimum of $8.50, Askinosie Chocolate does not realistically represent a sustainable solution. But they can serve as a valuable example for the growing craft chocolate movement, and the ever-increasing number of bean-to-bar operations within the United States. Without a single label on their wrapper, Askinosie Chocolate is building real relationships with farmers and creating real change within various communities. If each of the 100 other bean-to-bars that exist right now were to do the same, extending these efforts to the African continent as well, the impact could be a significant start to real change in the chocolate industry. This does not mean there would not still be barriers—ranging from the naïveté of consumers in interpreting various ethical labels, to the complacency of major industrial chocolate companies in overlooking various ethical and social issues—however, that is no reason not to try. 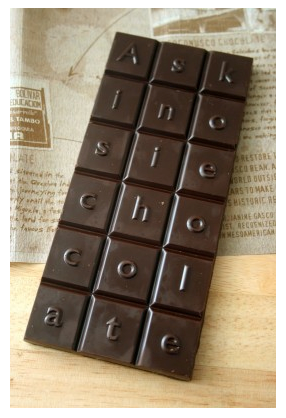 “Askinosie Chocolate.” Askinosie.com. Askinosie Chocolate, 2014. Web. 01 May 2014. Baradaran, Shima, and Stephanie Barclay. “Fair Trade and Child Labor.” Law.columbia.edu. Columbia Human Rights Law Review, 9 Jan. 2005. Web. 13 Mar. 2014. Starmagazine.com. Star Magazine, Nov. 2013. Web. 01 May 2014. Global Development, Dec. 2012. Web. 01 May 2014. “Fair Trade USA | Every Purchase Matters.” Fairtradeusa.org. Fair Trade USA, 2014. Web. CQ Researcher 17.19 (2007): 433-56. Harvard.edu. Congressional Quarterly, 18 May 2007. Web. 30 Apr. 2014.